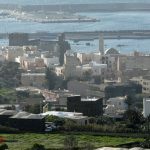 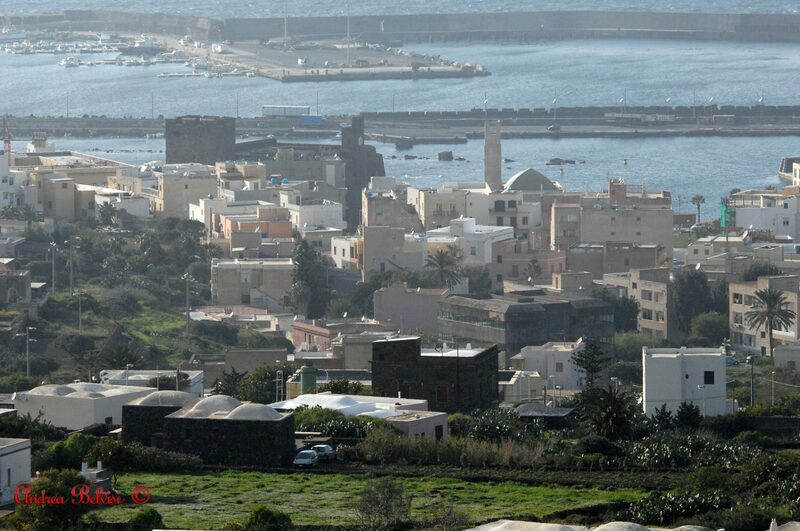 Bent-el-Rhia, the wind’s daughter, was the name Arab colonisers gave the island long ago. 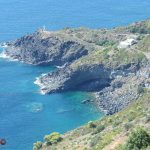 To the ancient greeks, it was Cossyra, or ‘small one’, the Sicilian island enveloped in the earth and the sea’s warm, intense colours. 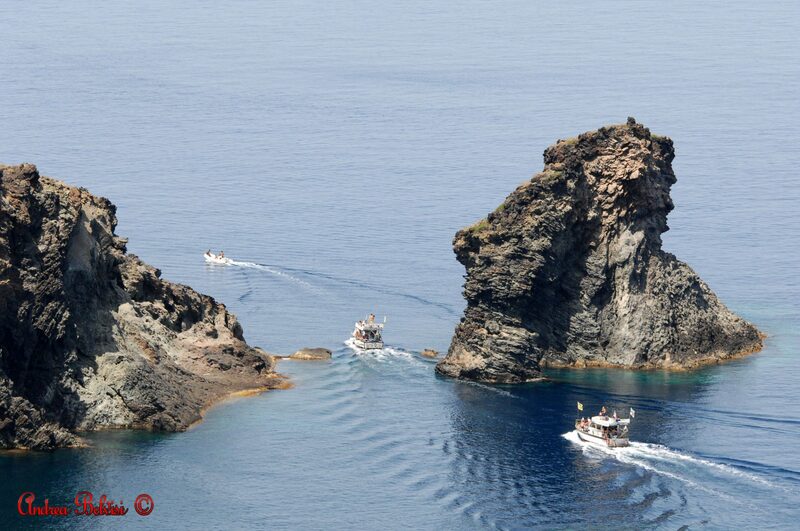 Today, it’s the Mediterranean’s Black Pearl, a name which reminds of its volcanic nature and its precious beauty. 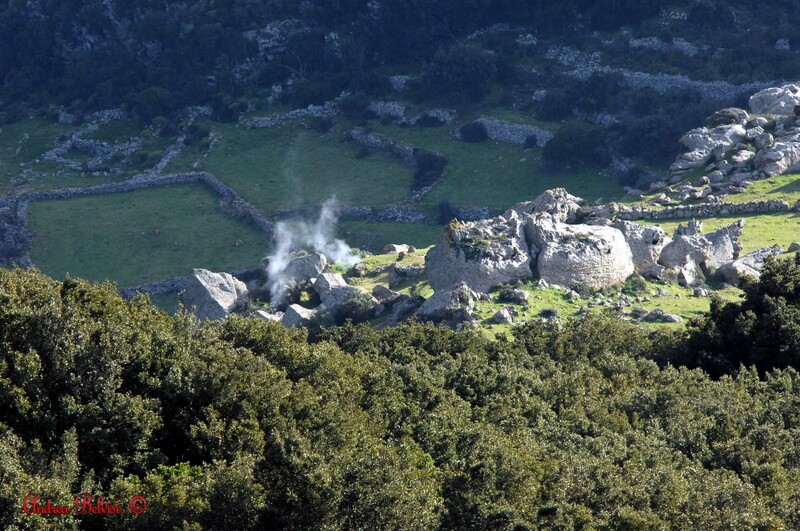 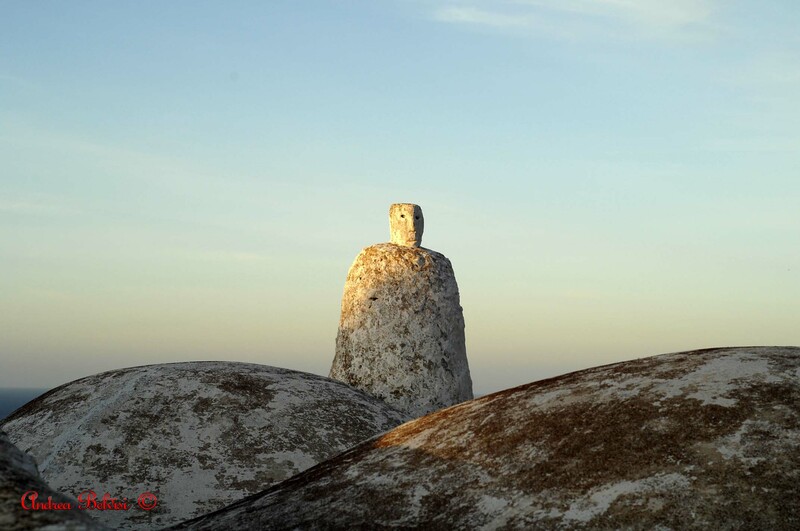 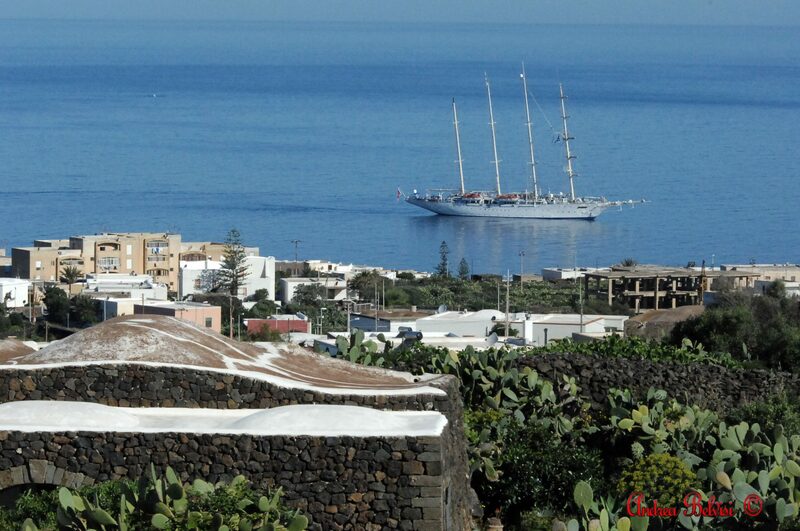 Between blue skies and the dark hues of the island’s rocks, the roofs of the dammusi are striking in their whiteness. 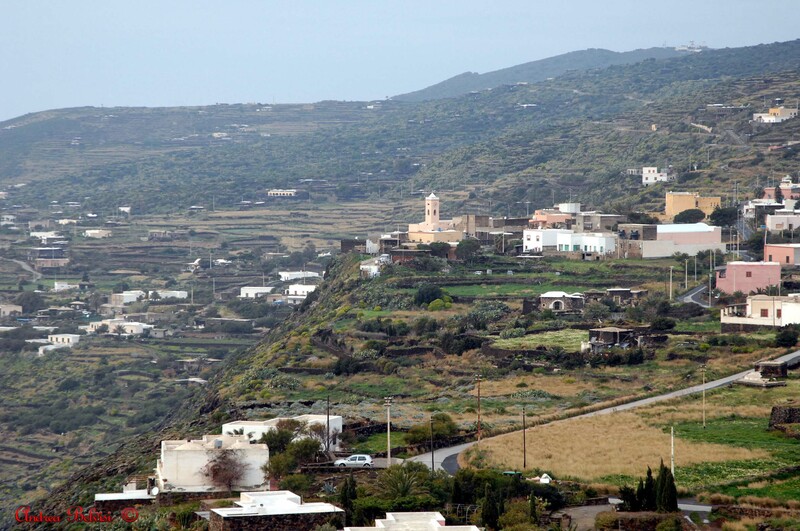 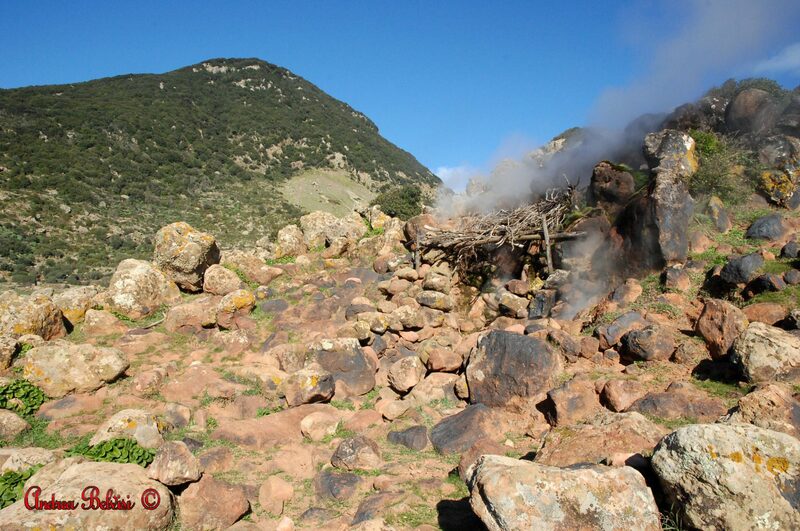 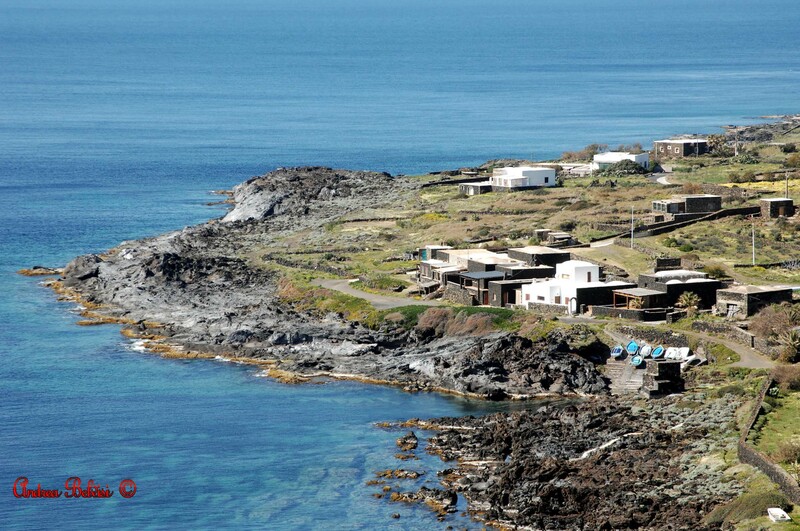 Dammusi are Pantelleria’s traditional homes, part of the island’s Arab heritage. 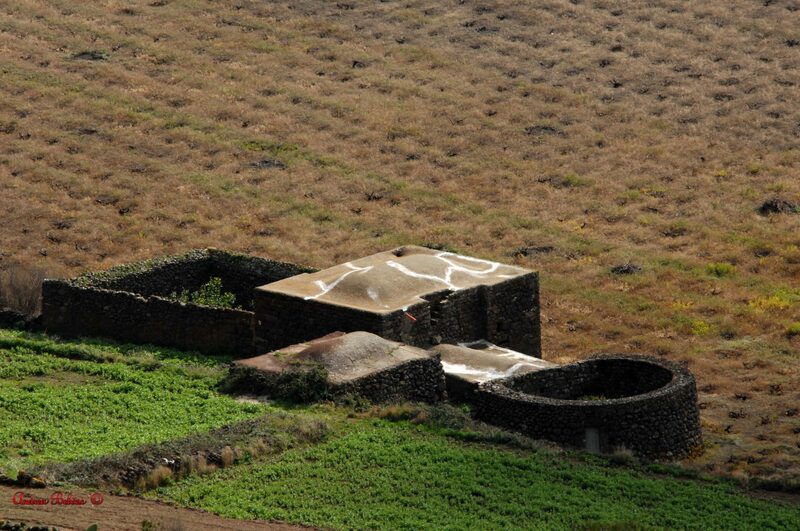 Charming rural buildings made out of volcanic rock, they are characterised by whitened domed roofs. 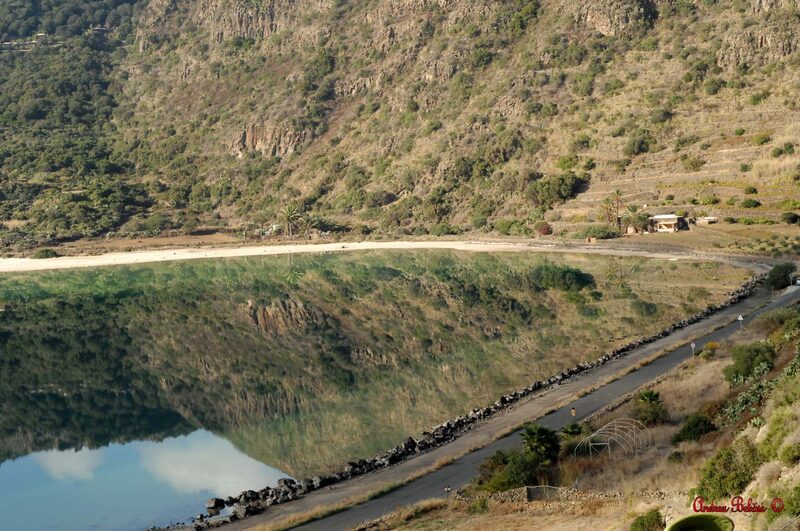 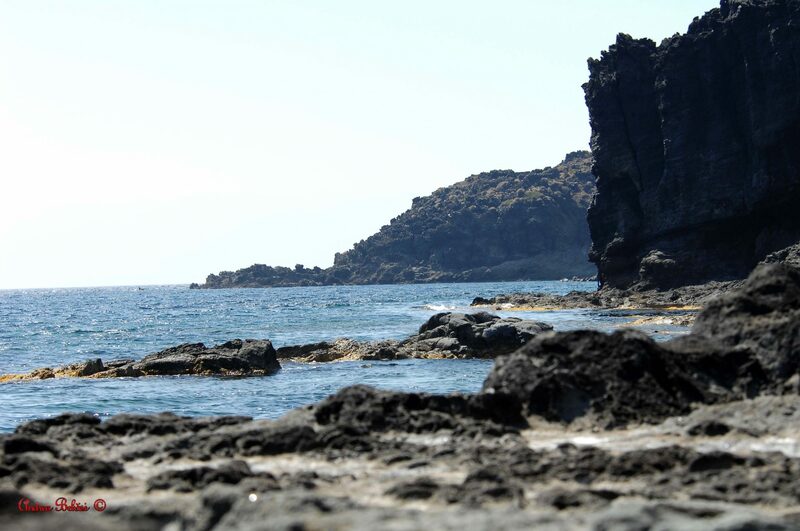 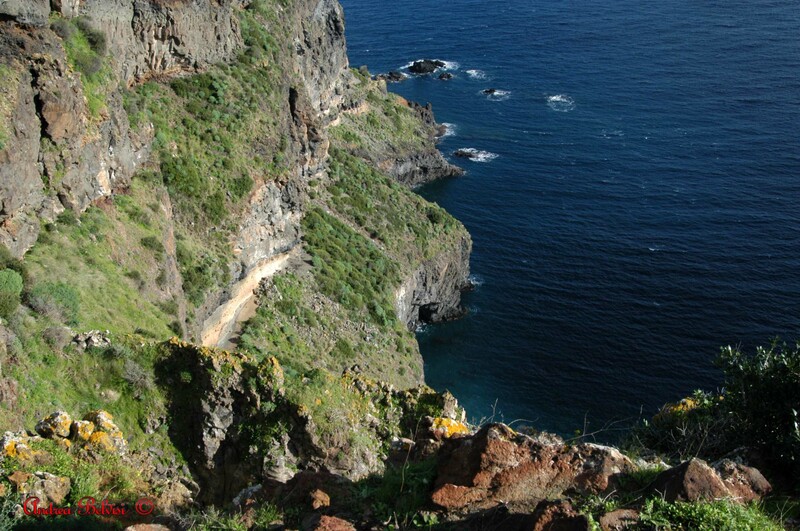 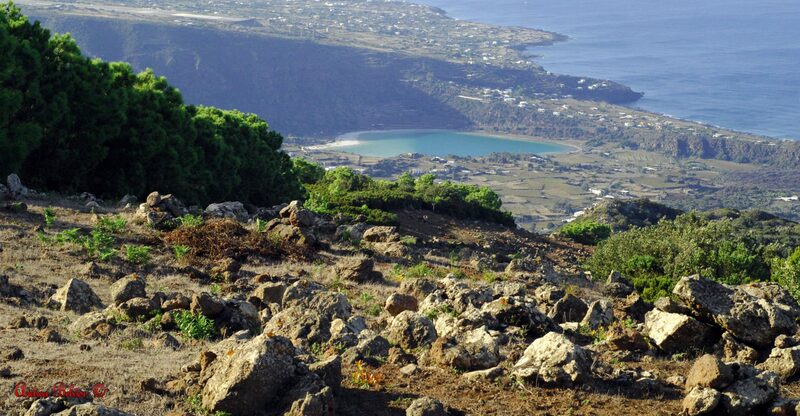 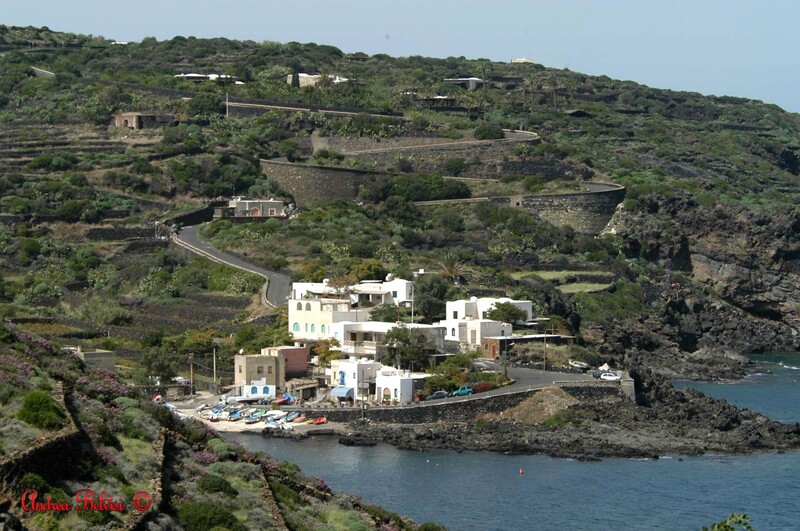 Pantelleria is the perfect island to explore, an ideal destination for enthusiastic travellers. 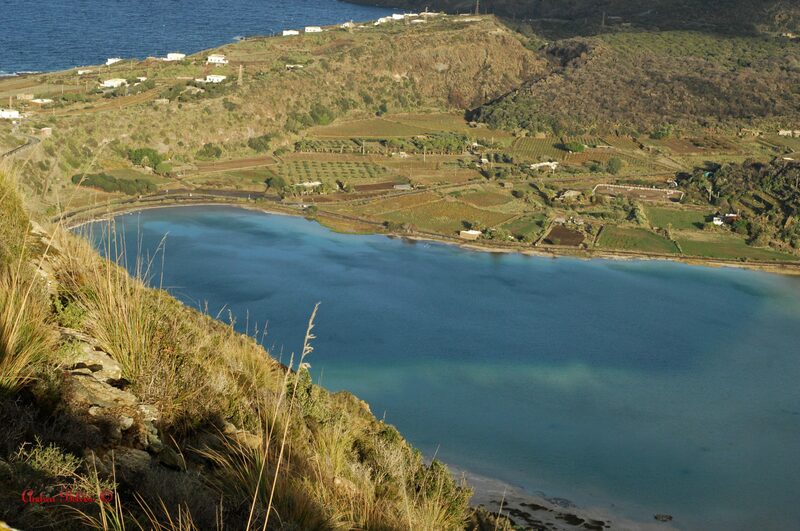 Here you can find comfort in totally uncontaminated nature, on the shores of Venus’ Lake (Lago di Venere) with its hot springs and thermal muds, its natural saunas hidden among the volcanic rocks, hiking along beautiful paths and vineyards, or surfing blue waves. 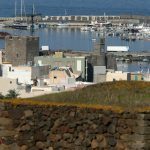 The island’s history is guarded by its majestic castle and archaeological sites, its history is well-kept in its borgo, an ancient village. 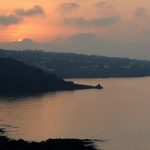 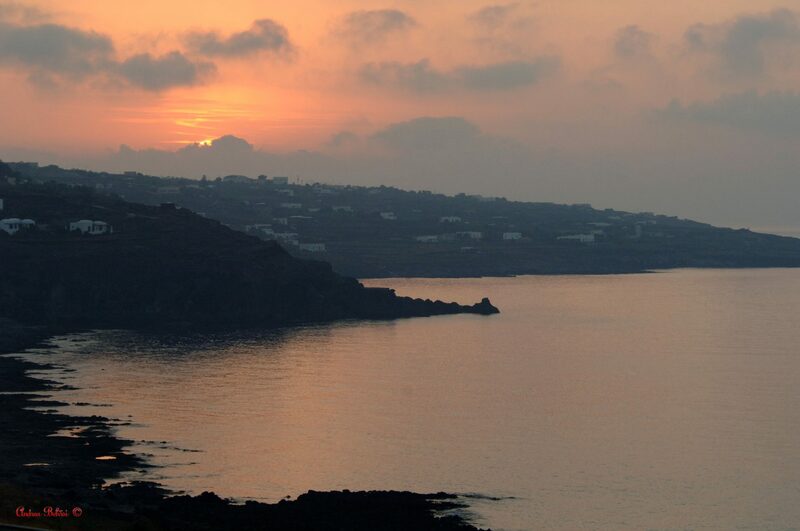 Pantelleria is an island you seek and love for its beauty and, once discovered, will become an everlasting emotion. 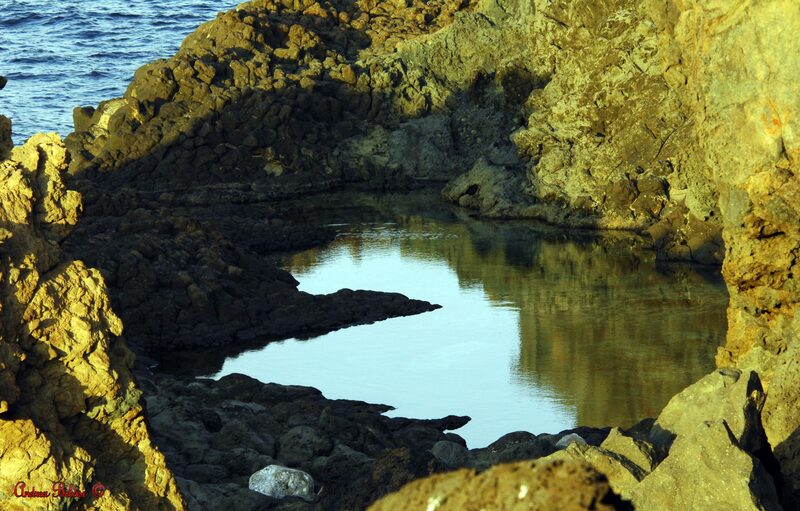 Along our coast, surrounded by the warm earth reminiscent of the East, the light is a constant symphony of colours, from dawn to dusk. 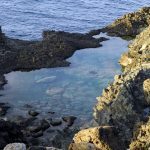 Picturesque bays and crystal-clear seawater light up in a variety of tones ranging from turquoise to deep, emerald greens. 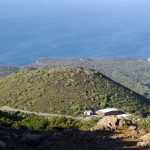 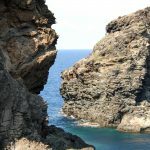 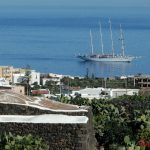 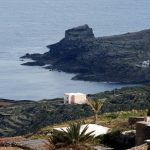 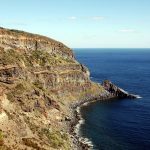 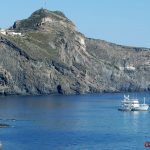 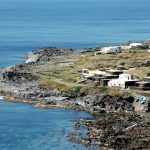 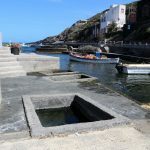 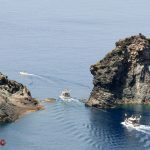 Pantelleria is the ideal destination for many types of visitors: those who enjoy sports, diving and snorkelling, and those who prefer more relaxing activities – for the latter, going on a boat tour of the island is the perfect way of discovering natural coves and cliffs that can only be reached by sea. 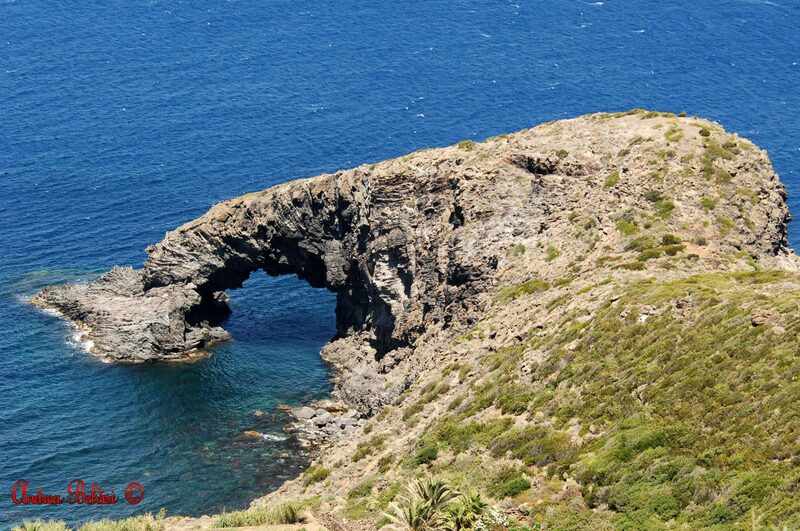 The Arco dell’Elefante is a weird looking rock formation, which has become one of the island’s best known symbols. 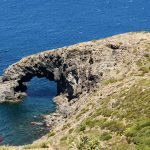 The name clearly derives from a strong similarity with the back and head of an elephant immersing its trunk in the sea, and thus forming a huge arch of rock. 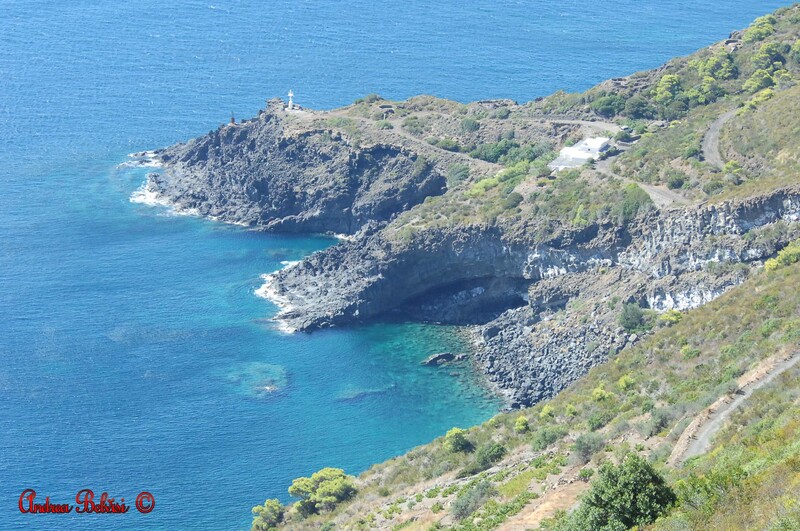 The Arco sits at the eastern end of the majestic cliffs in the Cala Levante bay, while its other end is occupied by the picturesque Faraglione di Tracino. 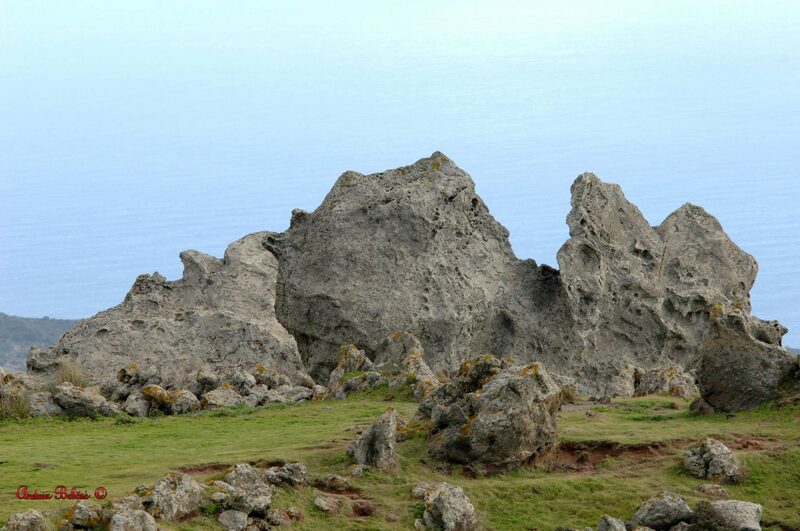 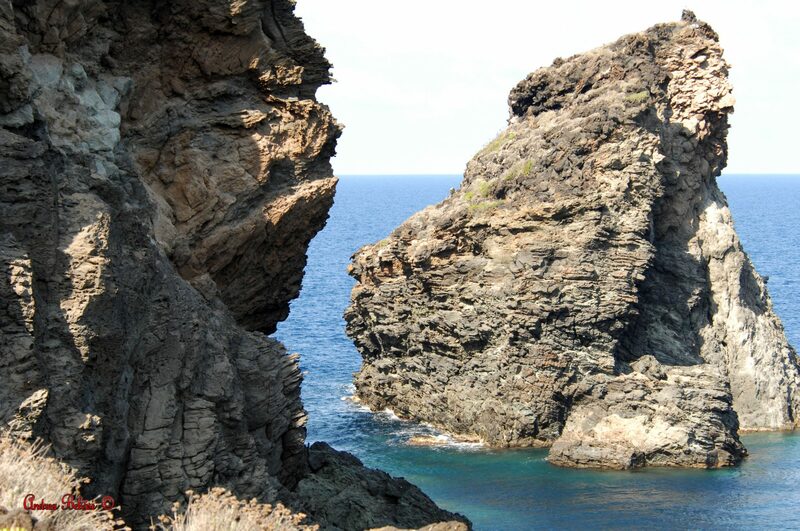 It’s an easily accessible area, and is an essential stop for many tourists visiting the island. 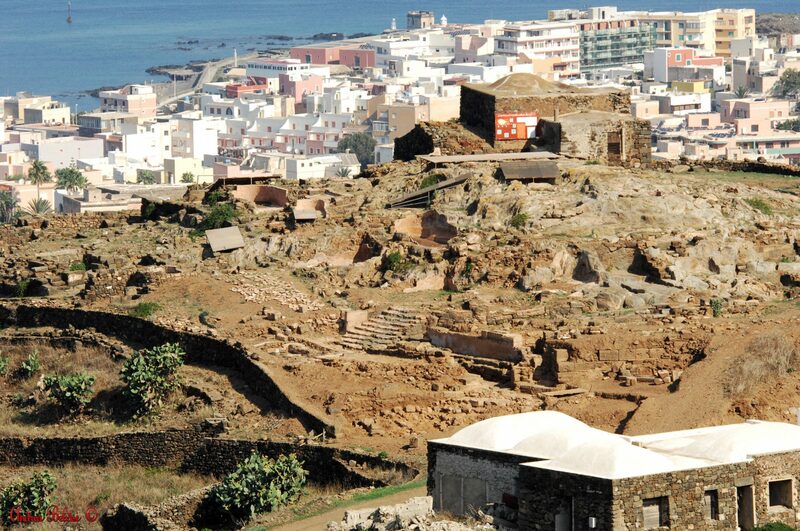 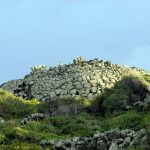 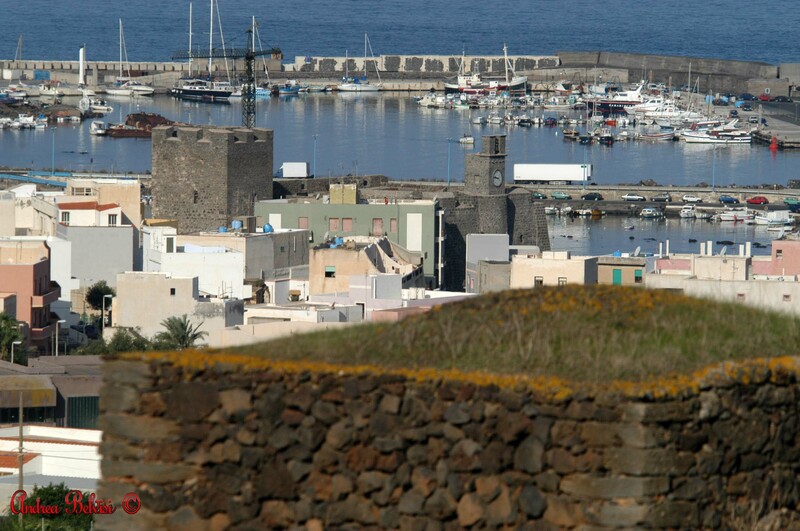 Pantelleria’s historic core is Castello Barbacane. 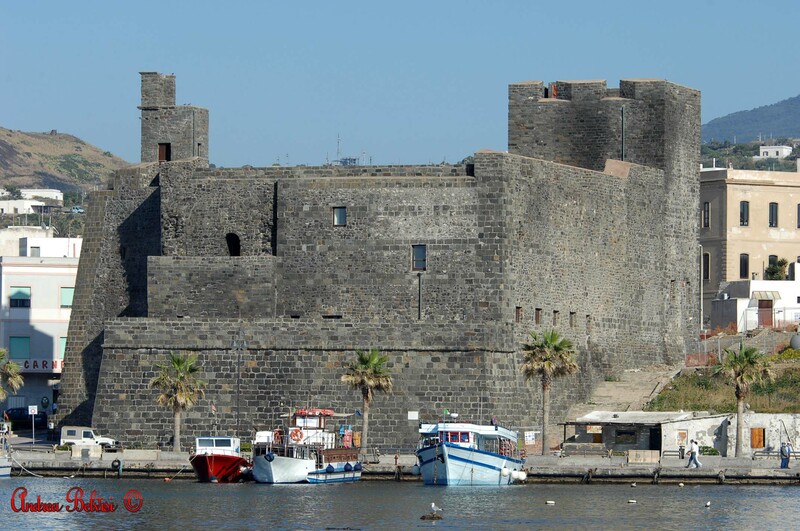 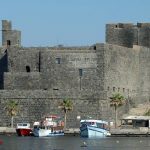 Located at the very entrance of the old harbour, the castle is a symbolic place for the island’s history and identity. 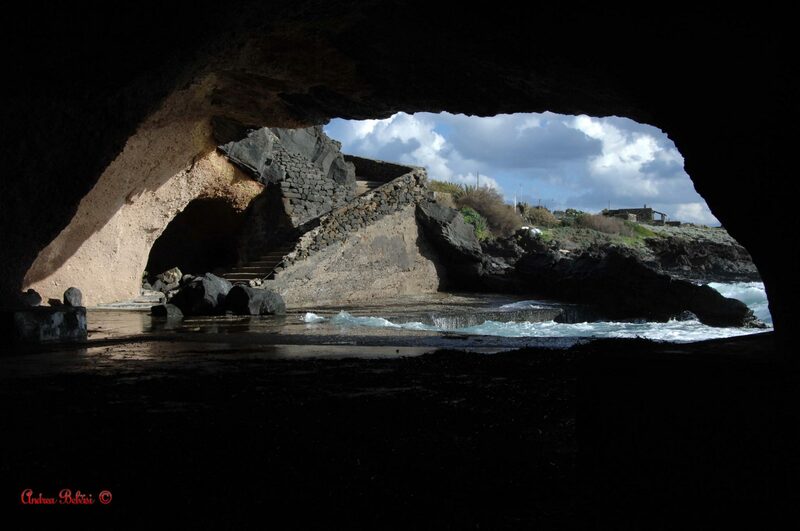 Its beauty is majestic, and it boasts an originally Medieval architecture carved entirely out of volcanic rock. 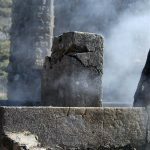 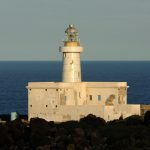 Although it was used as a prison until 1095 ad., today it usually hosts cultural events, while at the same time being a museum where the island’s most important archaeological findings – including the famous ‘Imperial Heads’ or Teste Imperiali – are kept. 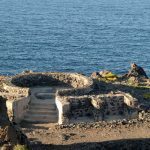 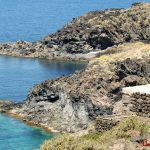 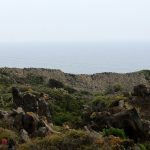 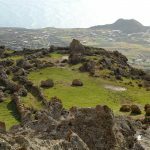 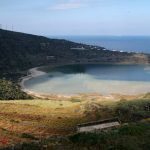 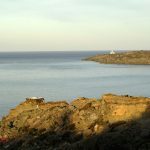 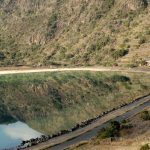 Leaving the castle and walking along the seafront, one reaches the first of the two quarters central Pantelleria was formerly composed of: ‘u Bborgu (‘the village’), the marine part of the town where commoners lived. 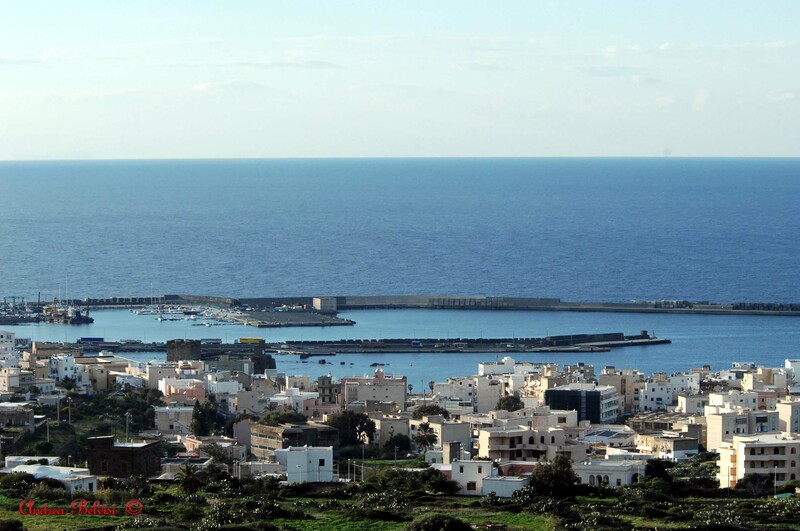 The seafront promenade is pleasant and relaxing, as it also includes most of the entertainment venues and many shops. 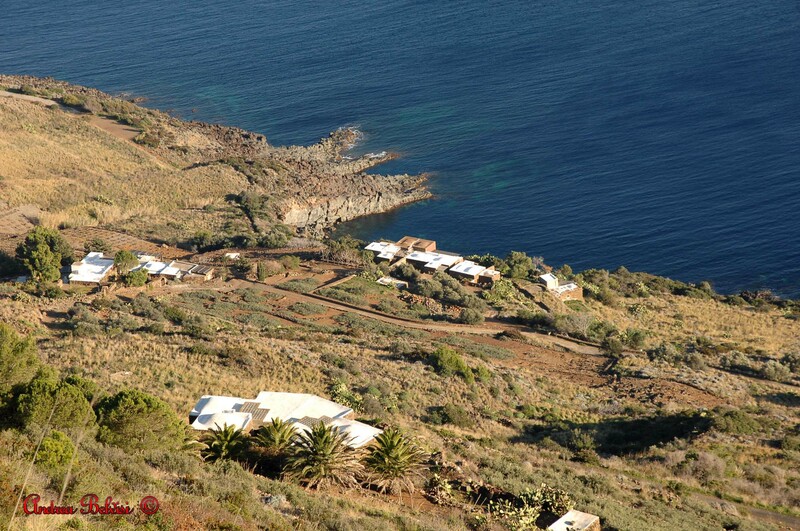 The island is rich in historic settings, ranging from the most remote to the more recent, rural past. 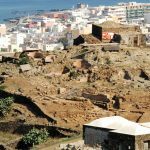 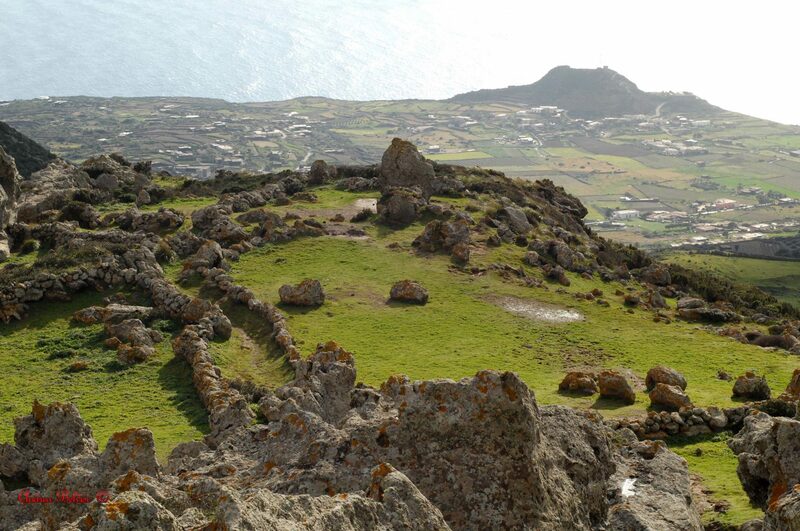 From the Bronze age to ancient Roman times, these archaeological sites are just as captivating as they were in the past, thus making the entire island an open-air museum. 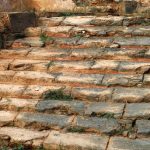 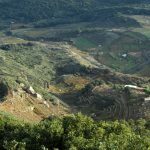 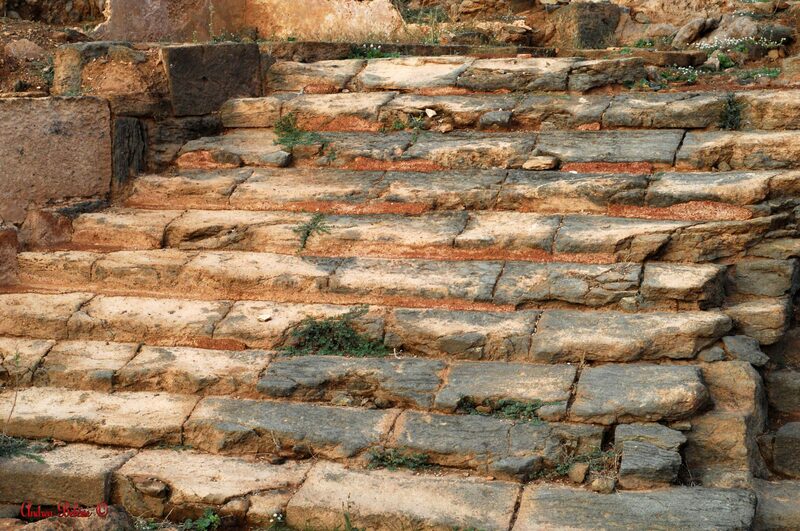 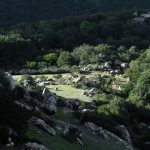 Together with Barbacane castle, the most impressive are the Sesi archaeological site, a 5000 year old necropolis, and the San Marco e Santa Teresa acropolis, a precious testimony to Punic and Roman settlements. 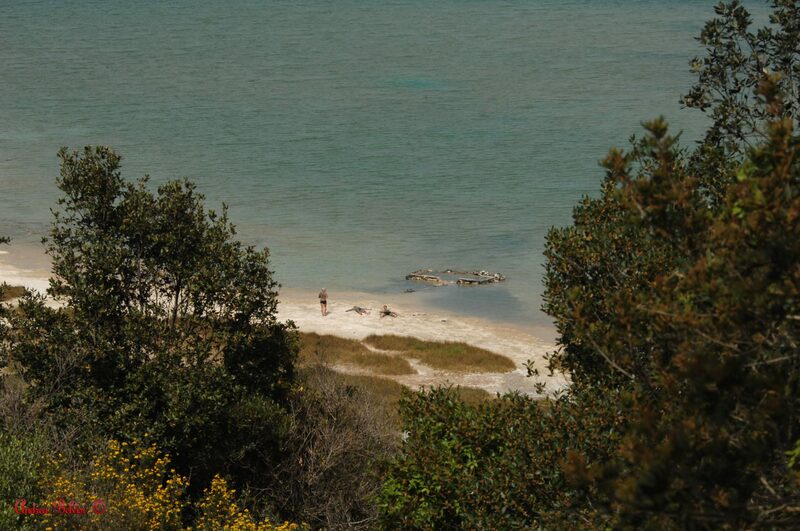 The abundant natural resources the island boasts are a source of wellness for body and mind. 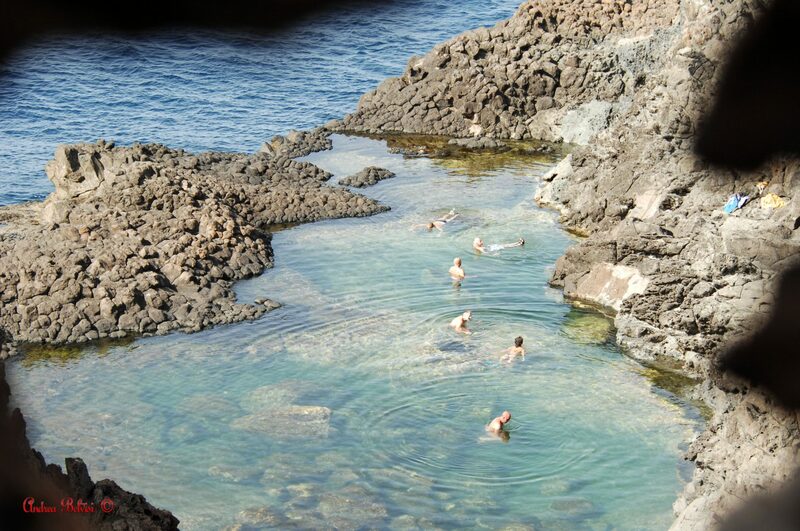 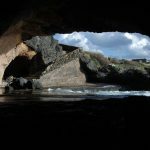 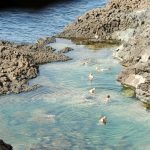 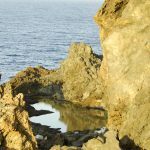 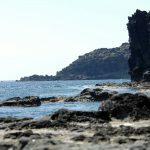 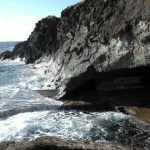 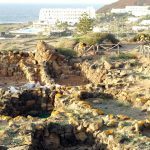 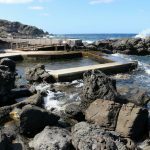 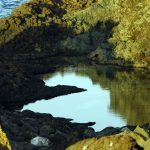 Here, the volcanic and wild nature has gifted us with wonderful settings, such as Grotta Sataria – a natural cave on the sea offering three covered hot spring pools – and Cala Gadir’s hot waters – more easily accessible, and in open air. 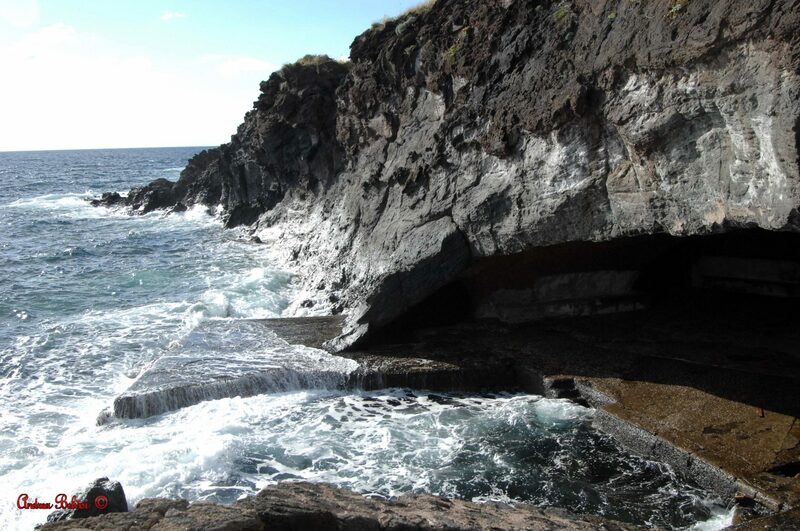 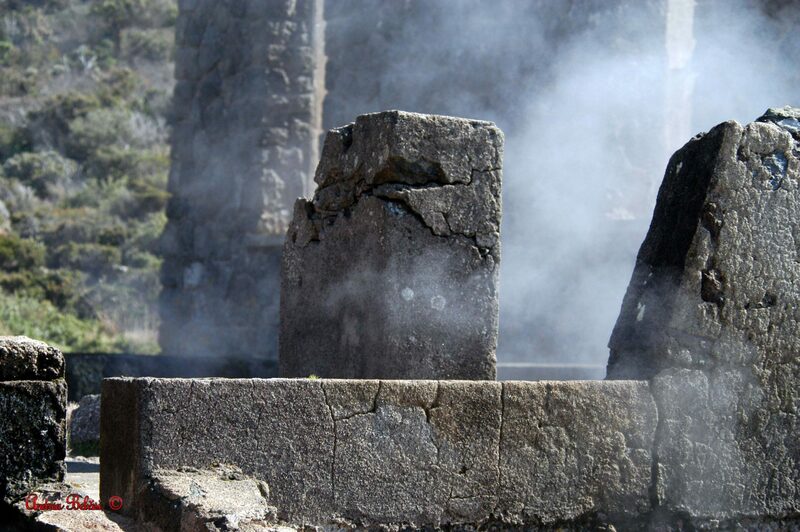 Another extraordinary location is the Benikula’ natural sauna. 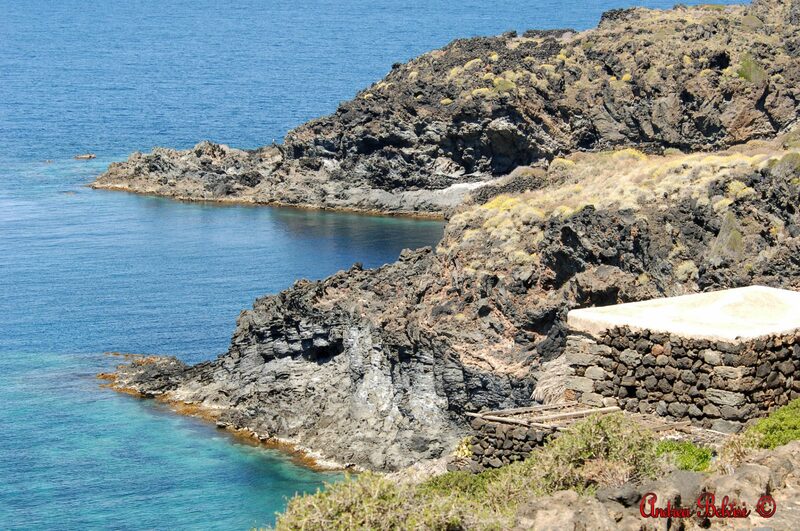 Pantelleria’s ancient soul is enclosed in the island’s favare. 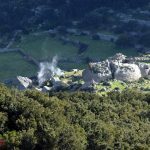 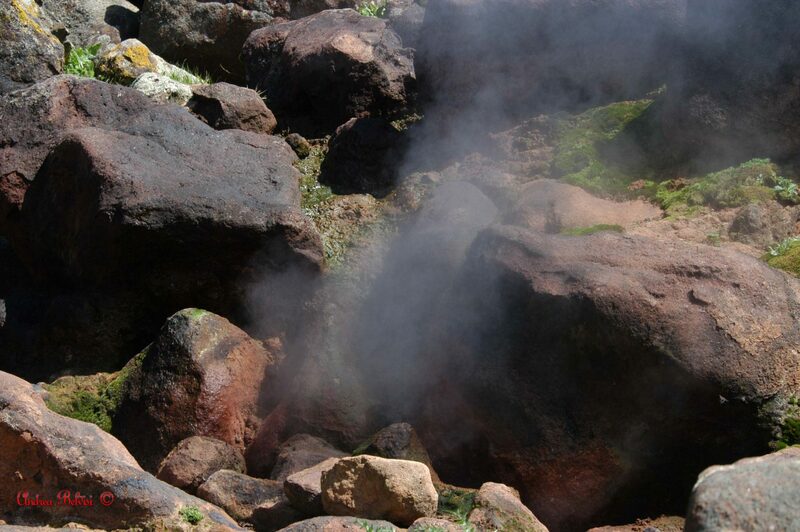 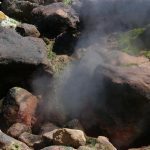 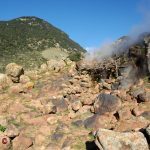 These are inland areas characterised by the presence of Mediterranean vegetation and of hot sulphur geysers emitting steam from cracks in ancient, solidified lava, sometimes reaching temperatures of 100°C in close proximity to volcanic craters. 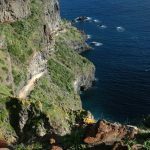 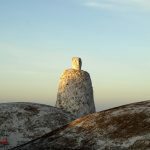 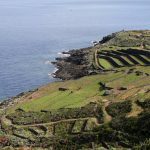 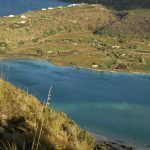 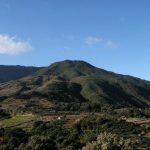 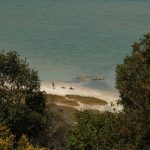 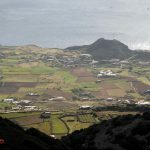 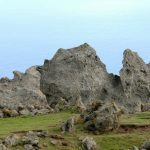 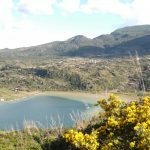 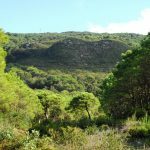 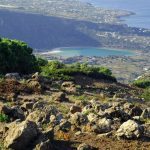 The scenery is breath-taking, even more so since they are relatively hard to reach: the path is challenging, ideally perfect for hiking aficionados, as you can also enjoy the island’s beautiful landscapes along the way. 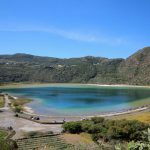 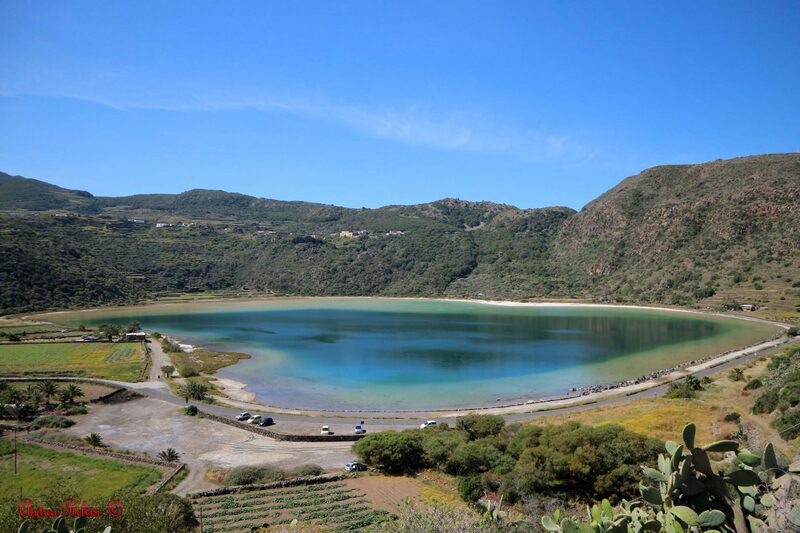 The lake popularly known as Specchio di Venere, or Venus’s Mirror, is one of the most magnificent attractions in the northernmost part of the island; it is known by this name because, as legend has it, Venus used it to look at her own reflection just before meeting Bacchus. 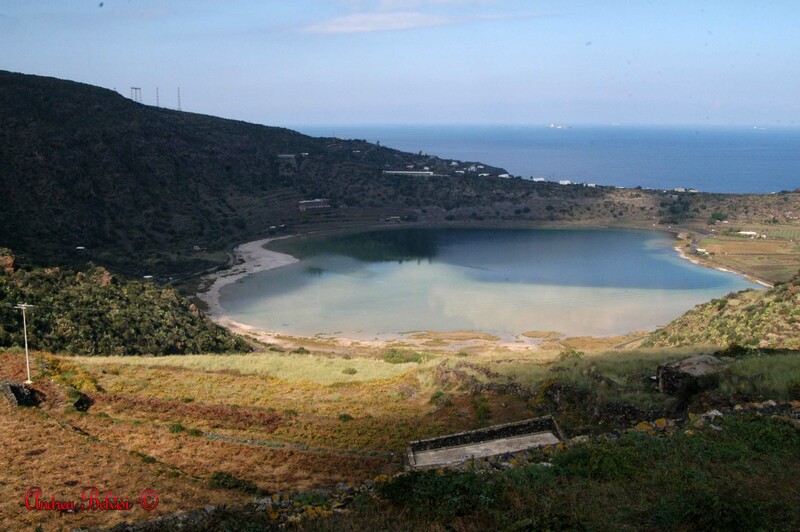 The water basin sits in a volcanic crater in an area known as Bugeber, and its popularity with tourists is not only due to its hot springs – which can reach temperatures between 50 and 60°C, making it the perfect spot for beneficial hot baths – but also to the possibility of observing numerous rare species of birds resting around the lake during migration season, such as cranes, flamingos and herons. 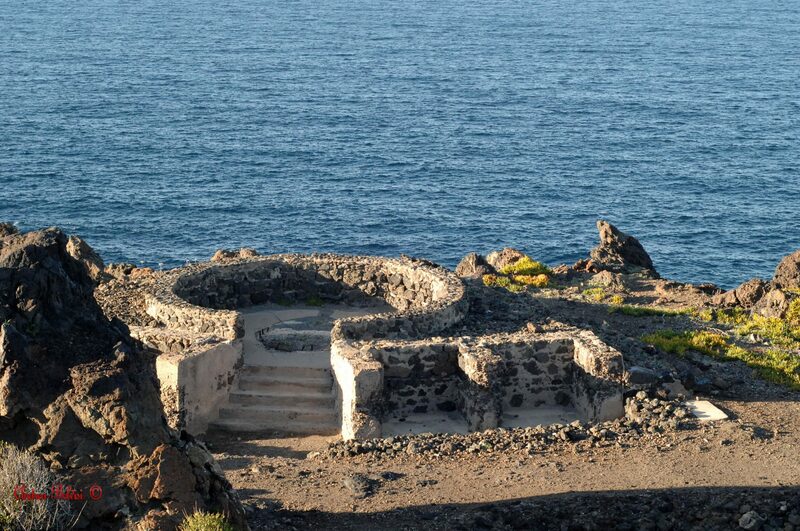 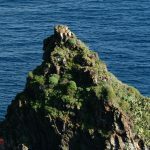 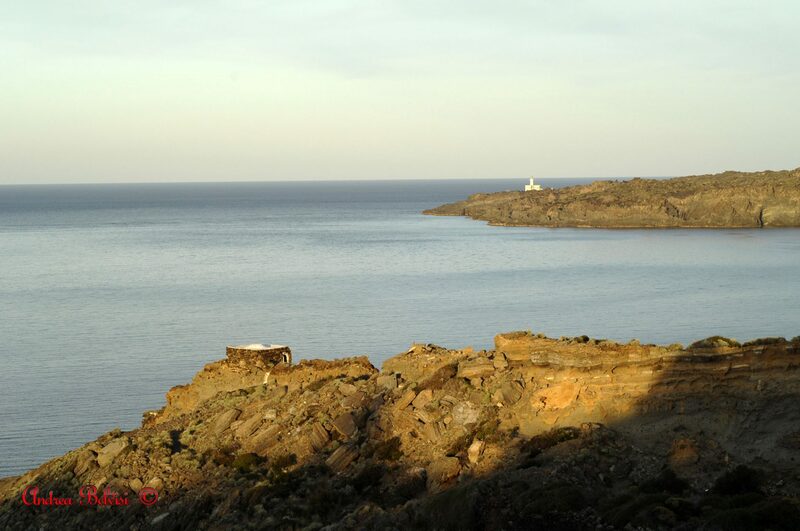 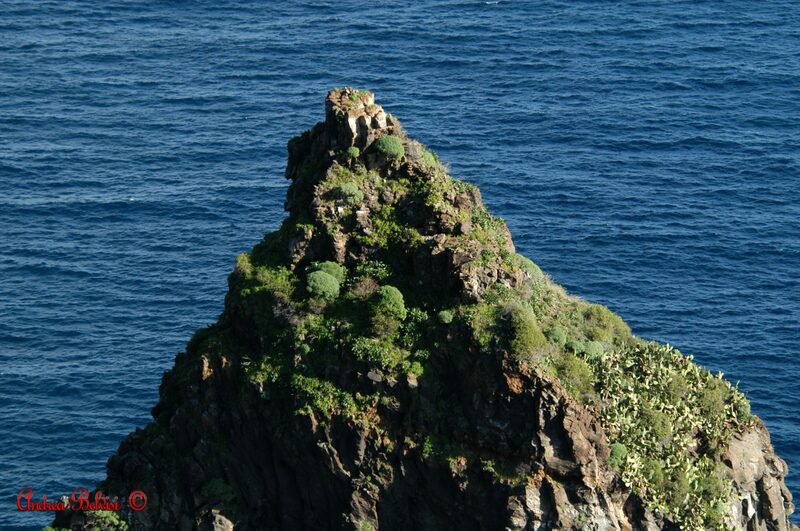 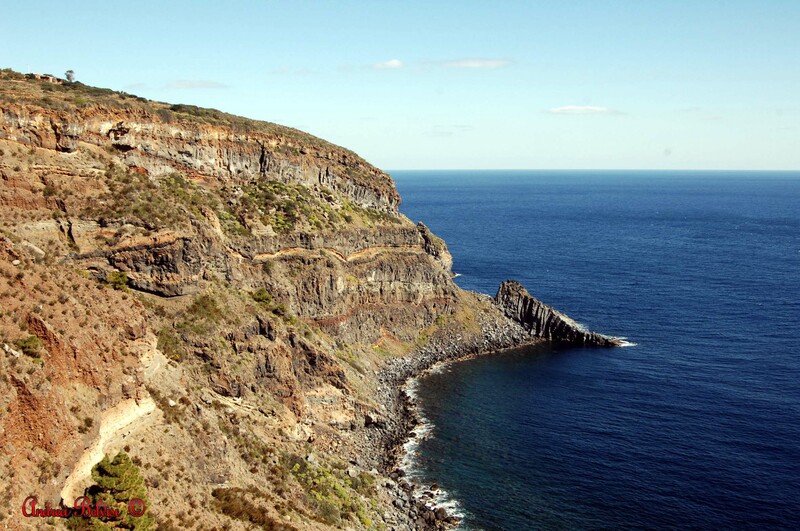 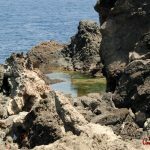 Laghetto delle Ondine is located on the north side of Pantelleria, and is part of the Punta Spadillo area. 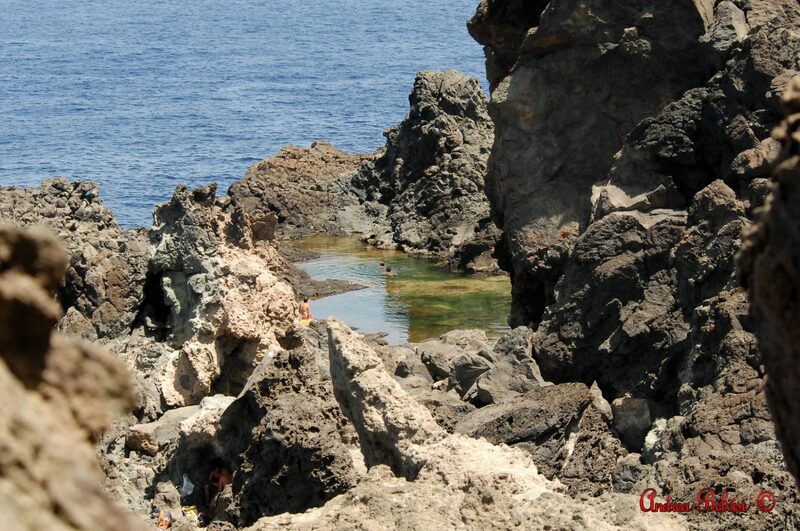 It’s a small, natural seawater lake carved out of rock and completely surrounded by the sea. 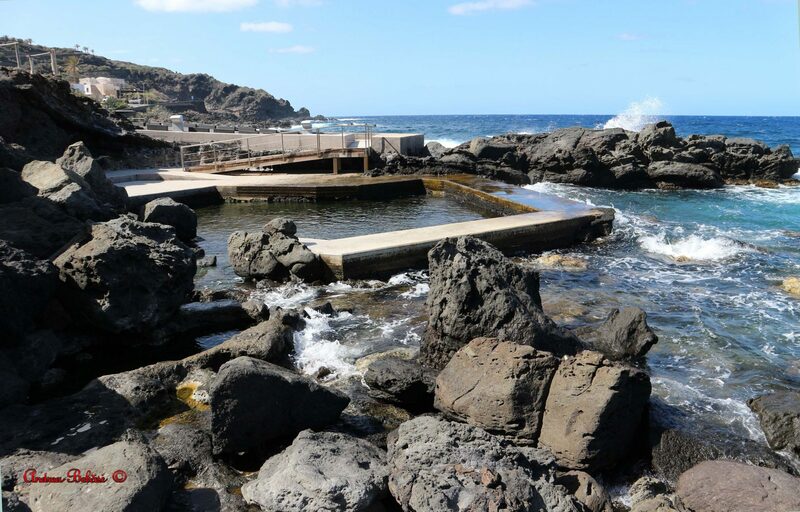 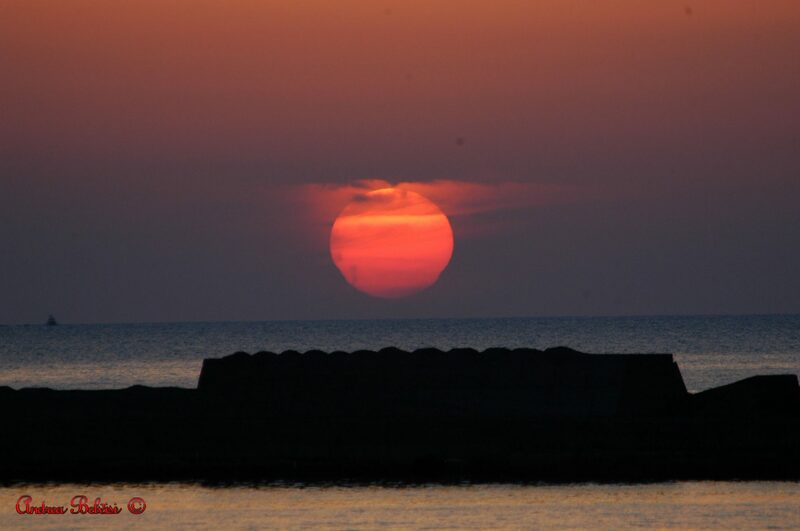 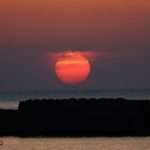 The best time to visit it is when the sea is slightly rough, thanks to the magnificent show offered by the waves crashing onto the rocks and continuous water renewal. 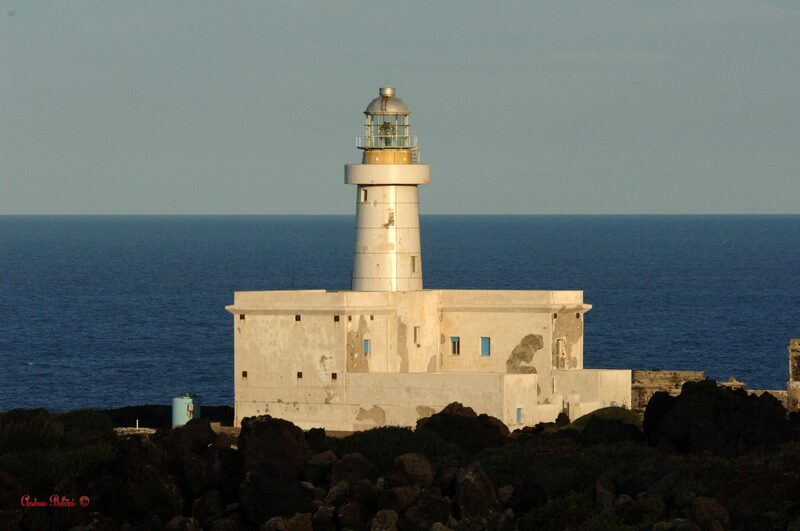 An enchanting place and one of the most loved by anyone visiting Pantelleria, together with its Lighthouse built in the late 1800s. 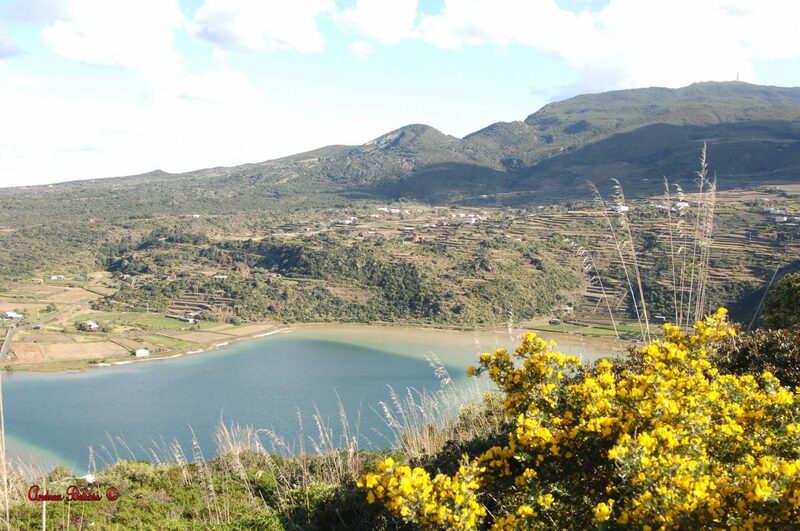 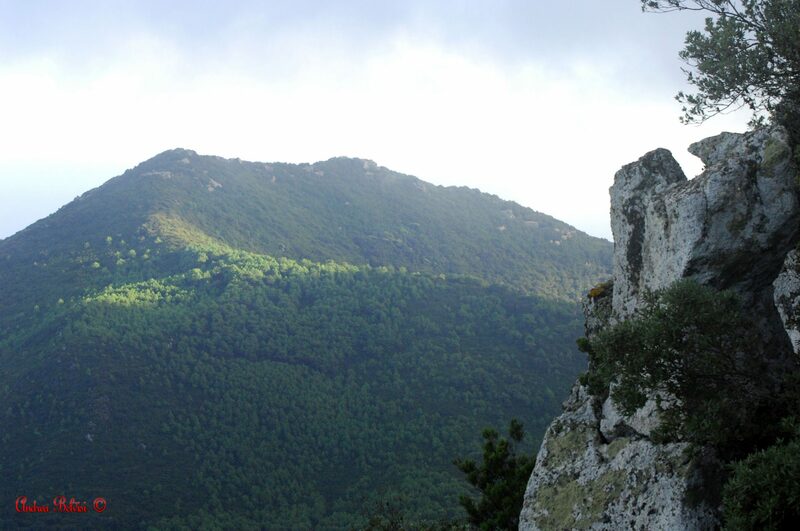 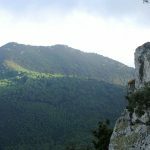 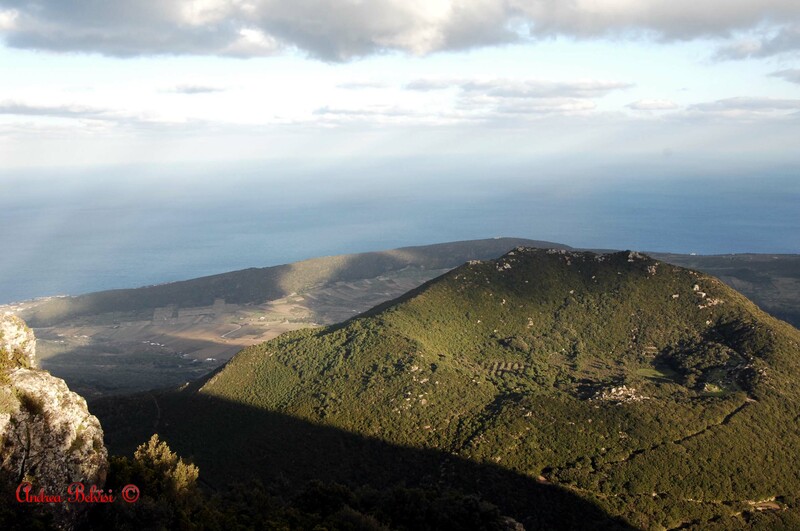 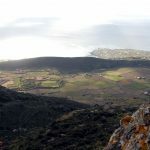 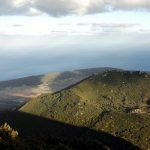 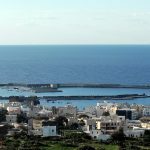 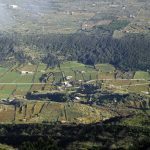 For those who enjoy hiking, walking and breathing fresh air Montagna Grande (or Big Mountain), towering over the island at 836m above the sea, is a perfect destination. 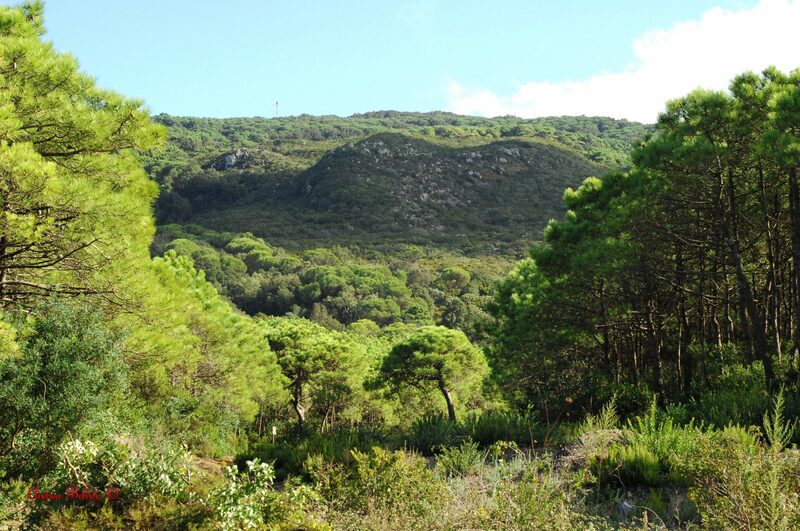 It’s a true green oasis, characterised by maritime and Aleppo pines, oaks and the numerous paths surrounded by Mediterranean vegetation. 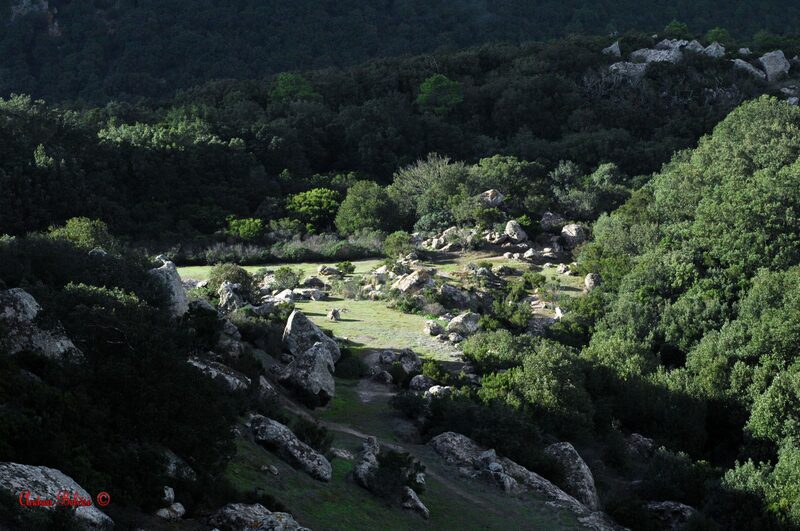 It’s an ideal attraction for those who love nature and walks. 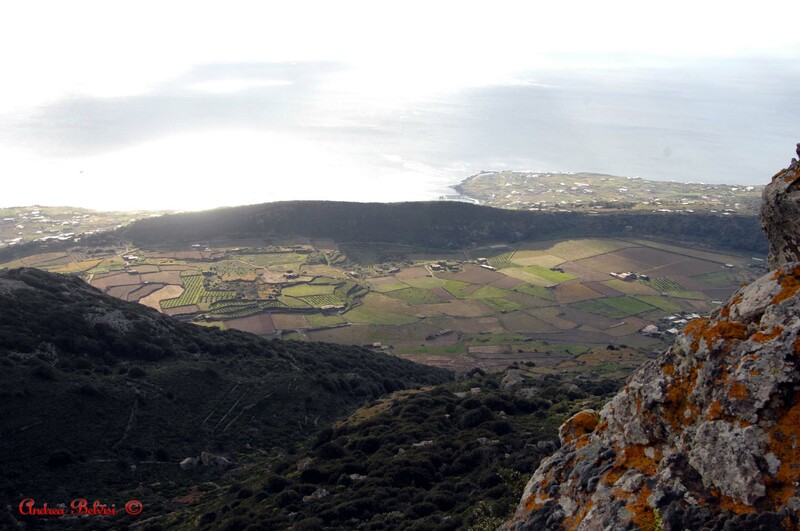 The view from the top is absolutely wonderful and definitely won’t disappoint. 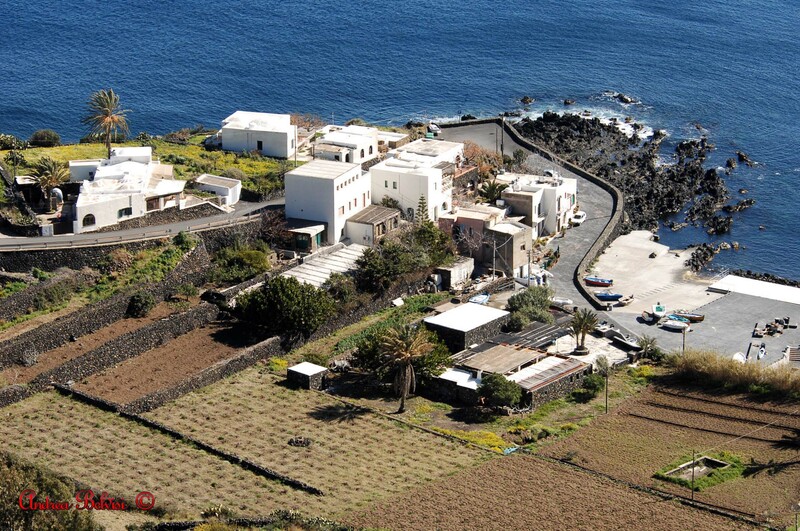 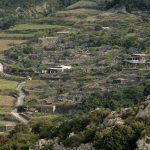 Pantelleria’s identity is represented by its terraces, its dry walls, its beautiful Arab gardens and dammusi, together with its famous viti ad albarello (head-trained bush vines). 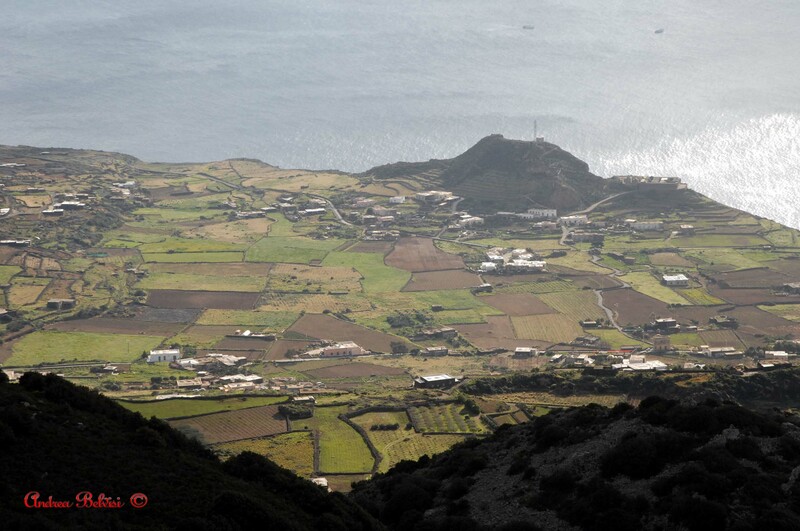 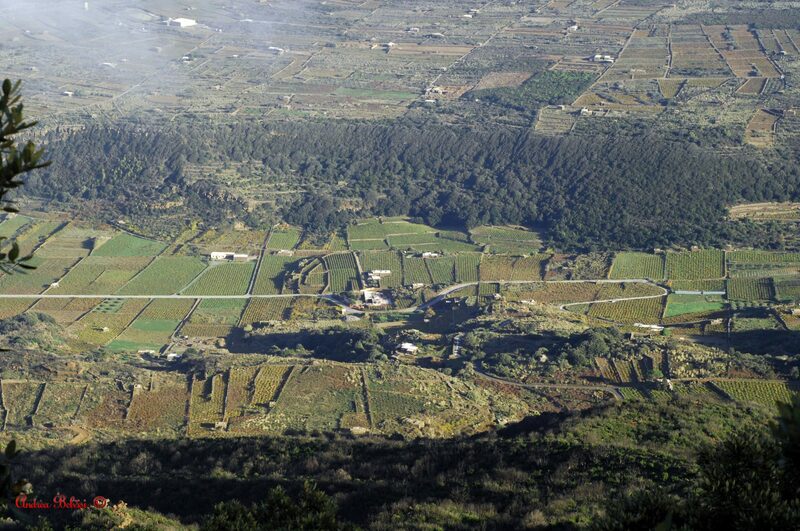 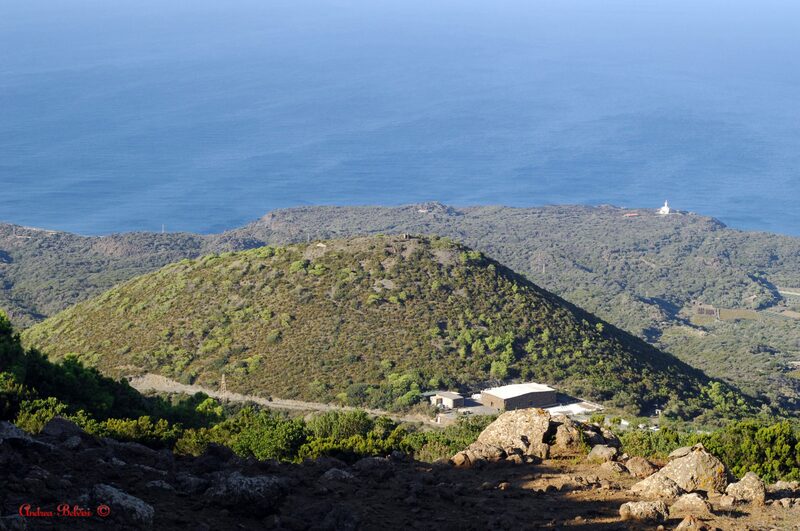 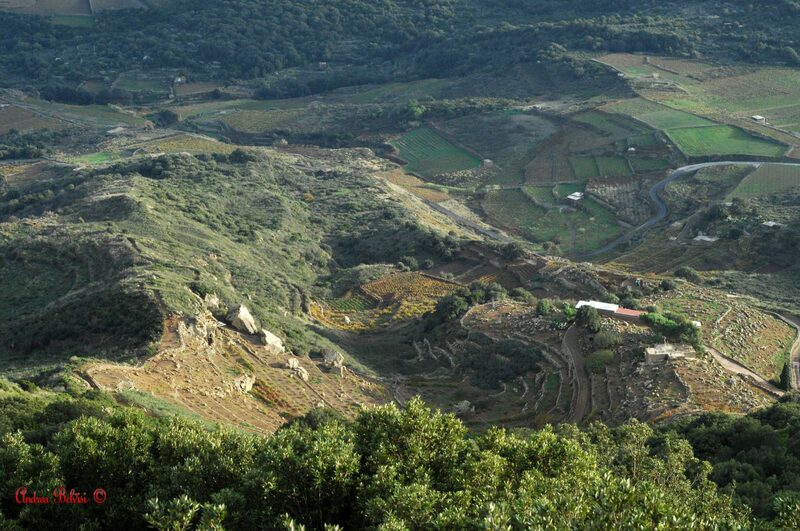 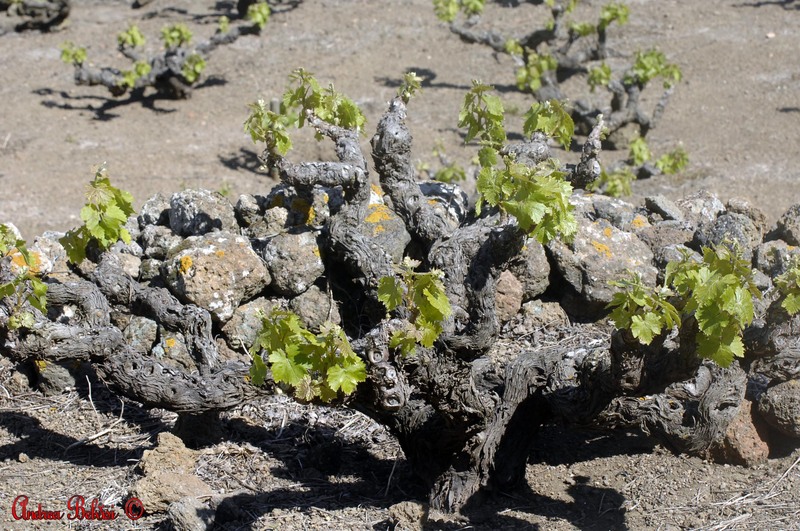 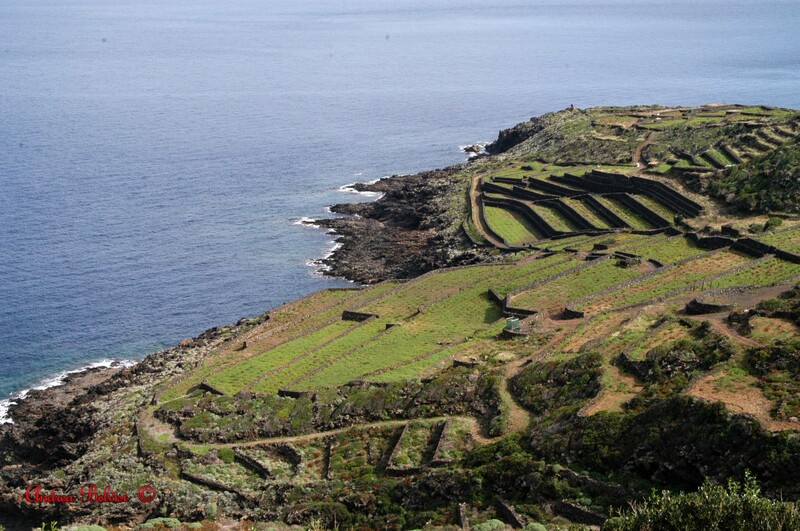 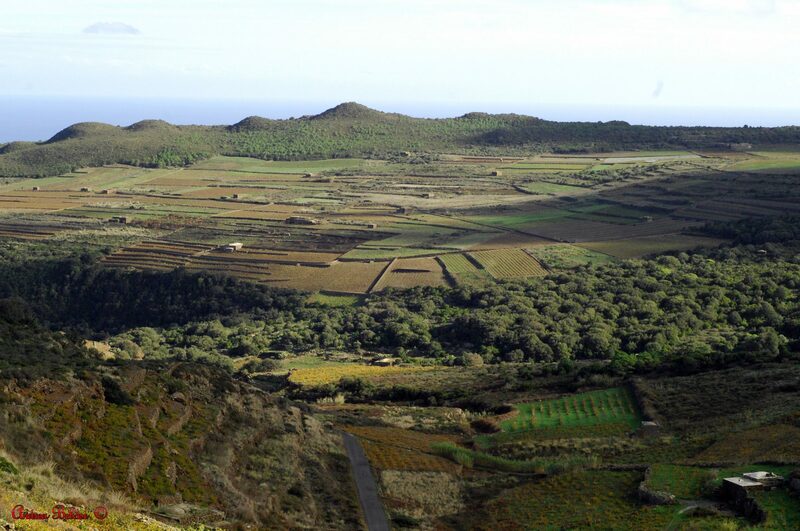 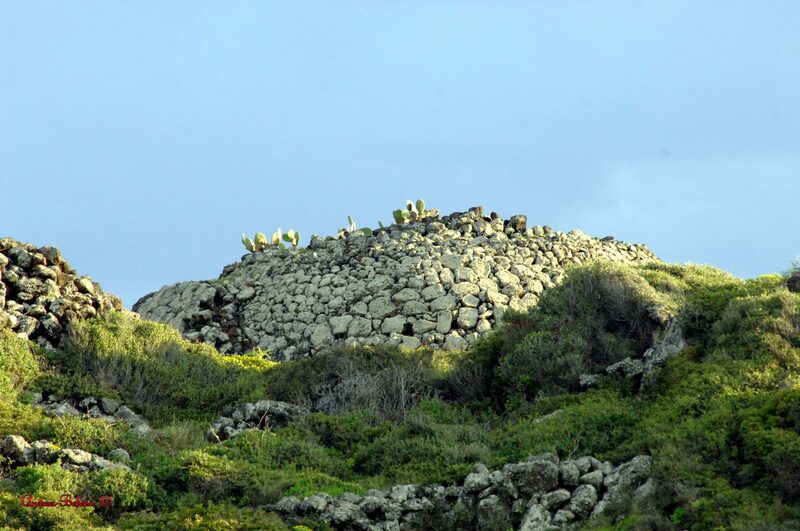 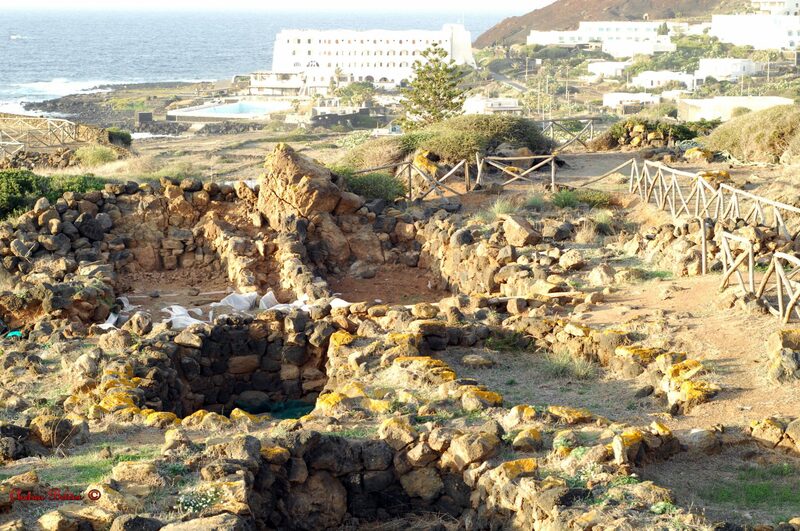 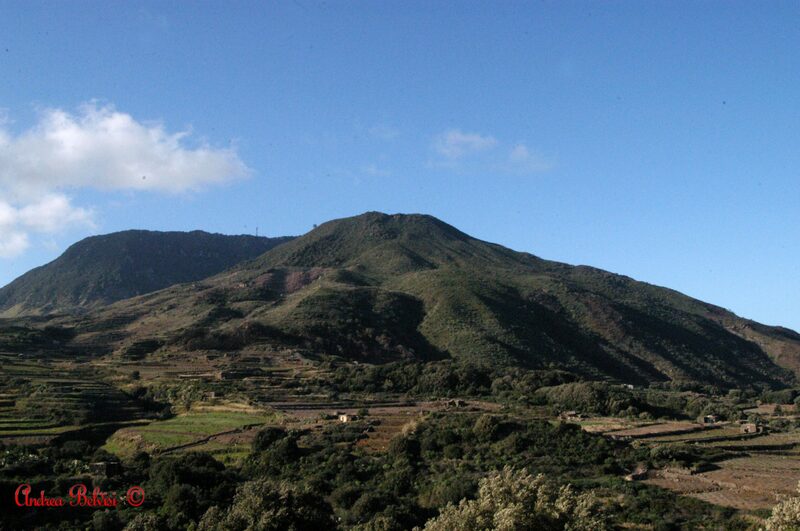 Pantelleria’s vineyards have been inscribed on the Representative List of Cultural Heritage of Humanity by UNESCO. 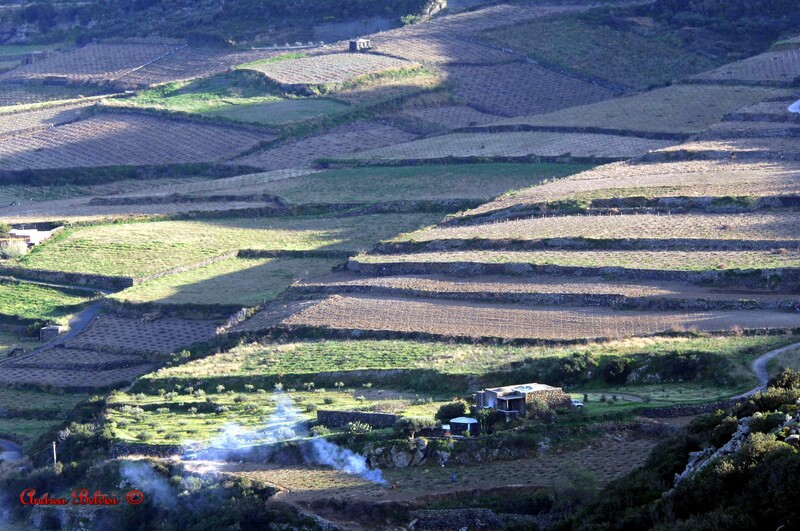 This cultivation technique is traditionally based on the creation of holes in the terrain, about 20cm deep. 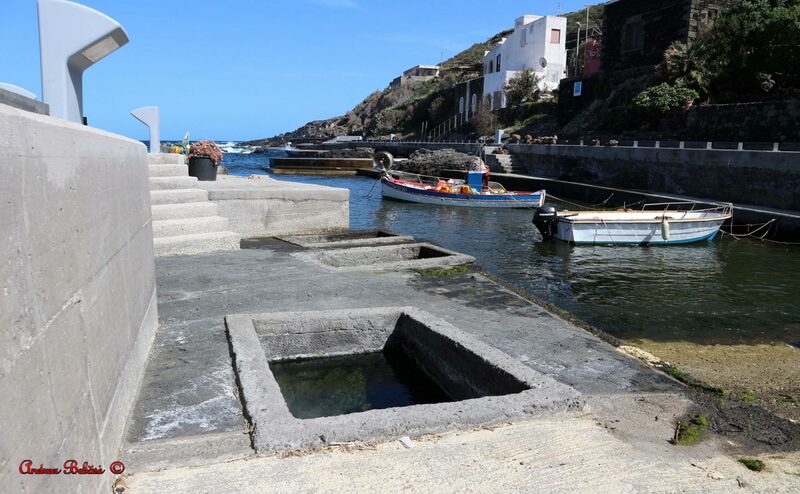 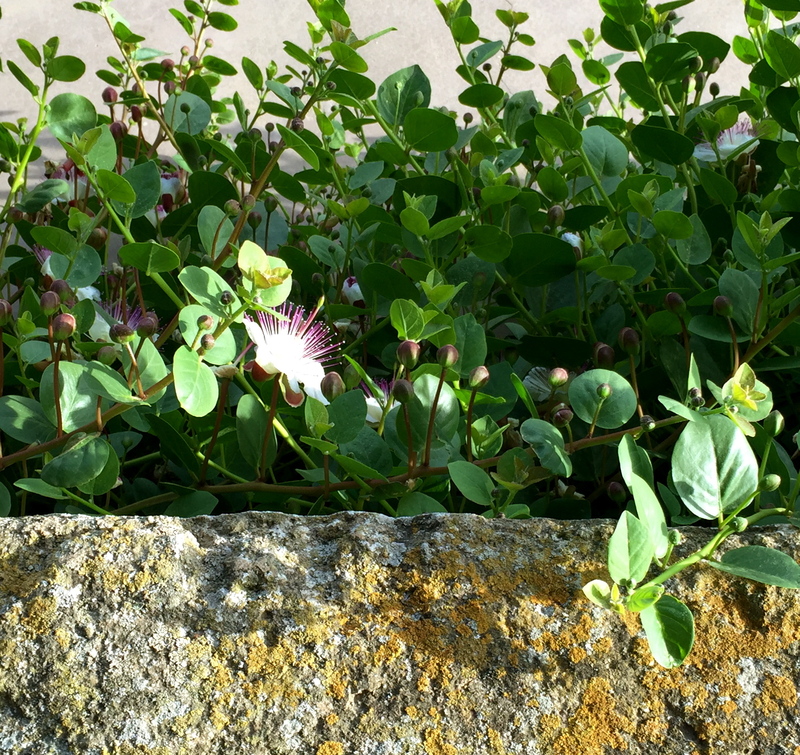 Growing inside these holes allows the vines to exploit the island’s low water resources, while at the same time being protected from the climate. 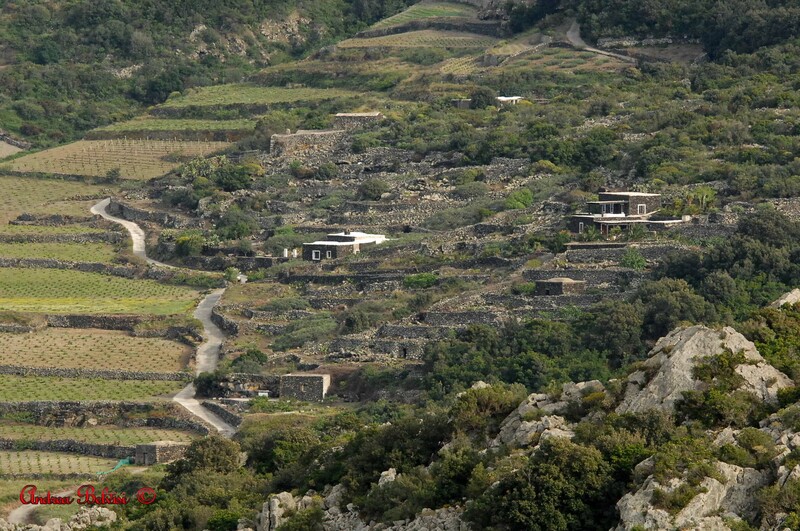 The Zibibbo vineyard, also known as Moscato d’Alessandria, produces a type of grapes originally from North Africa. 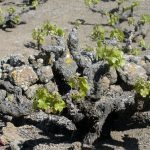 The island’s climate, which is hot and dry, provides the perfect conditions for these grapes to develop its most distinctive characteristics, such as the sugary taste and its persistent, complex aromas. 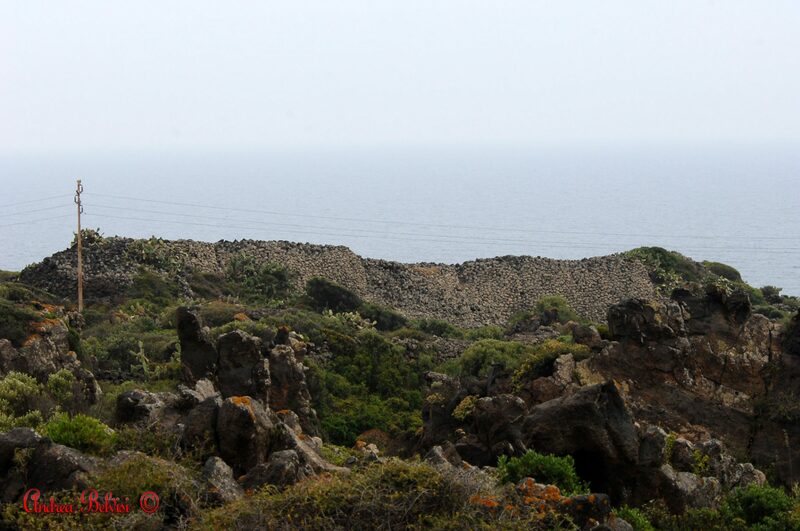 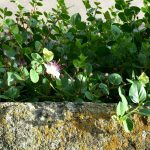 Pantelleria’s terrain requires constant care, patience and physical labour, but these efforts tell of a way of life which is in perfect symbiosis with nature. 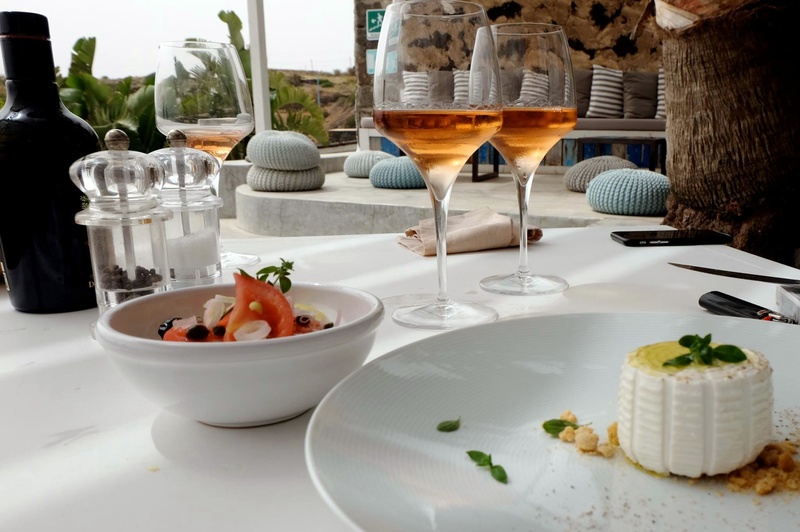 Pantelleria’s gastronomic traditions are mostly tied to seasonal products from the land, which are only sometimes enriched with flavour from the sea. 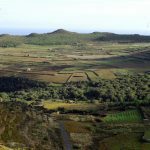 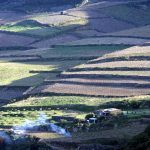 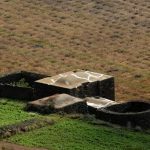 It would appear bizarre for an island, but the farming traditions of the island have very deep roots. 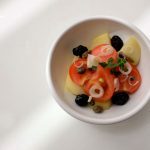 Capers, almonds and mint are the stars of many traditional recipes. 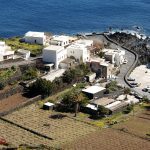 Pantelleria’s pesto is a speciality made with locally grown, flavourful capers, and it’s used as a dressing for main dishes or sauces and pates. 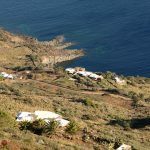 The island’s most famous dish is Cous cous – a variation on the traditional North African recipe including both seafood and products from the land. 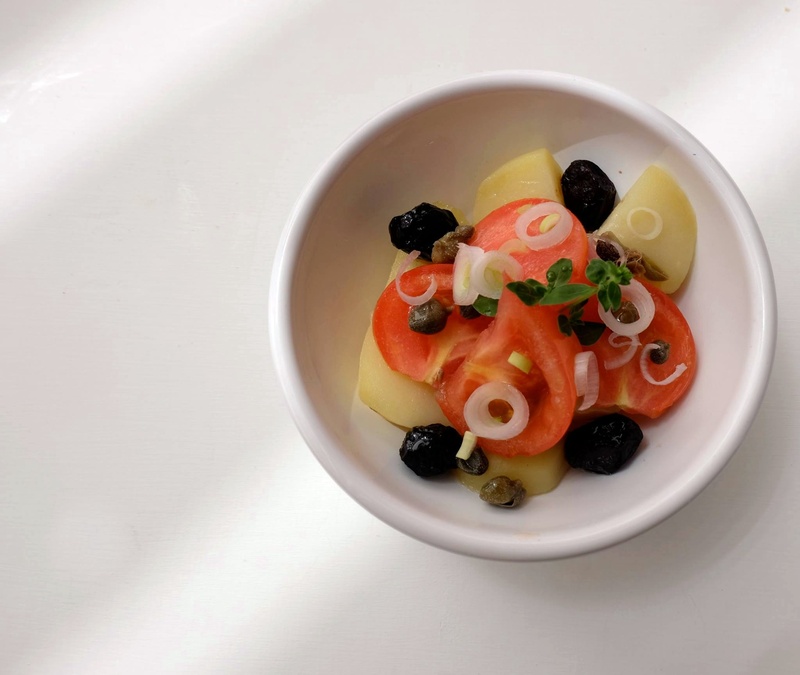 A second dish which celebrates the bond between the land and the sea is Pantesca salad: to a classic base made out of tomatoes, potatoes and olives, products such as capers, red onion, purslane, dried roasted fish (pisci sciutto) and dried cackerel eggs are added. 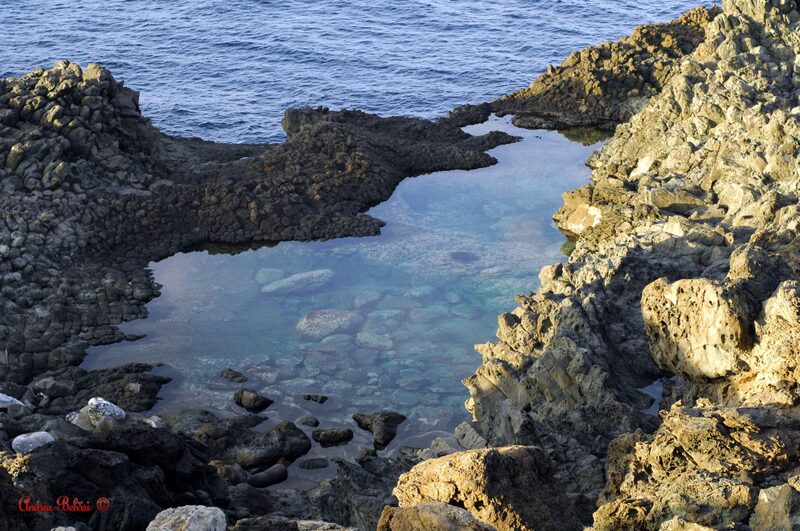 The island’s culinary tradition also boasts flavourful game and seafood dishes. 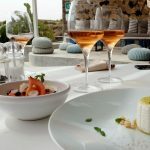 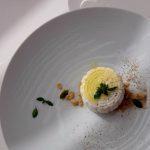 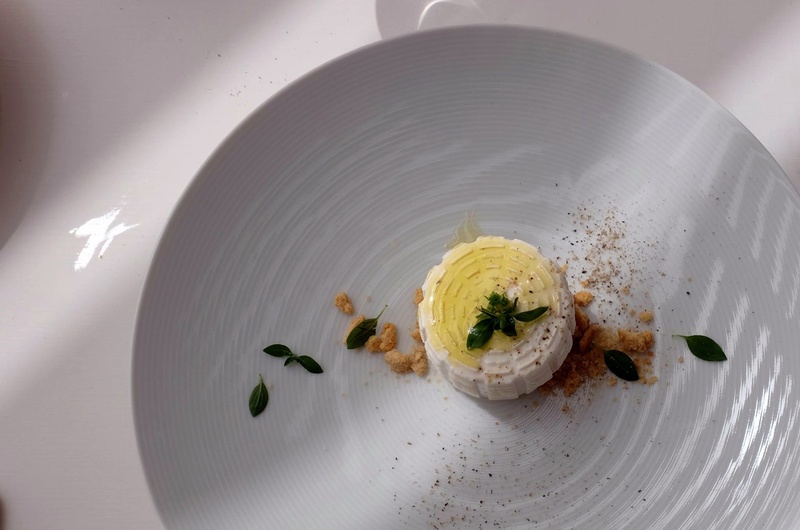 Pantelleria’s desserts should not be forgotten! 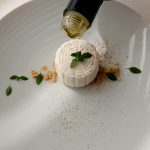 The Bacio Pantesco – or Pantelleria’s Kiss, is a typical dessert made with fried pastry and ricotta cheese, while Cassateddre are pastry shells filled with pastry cream or ricotta. 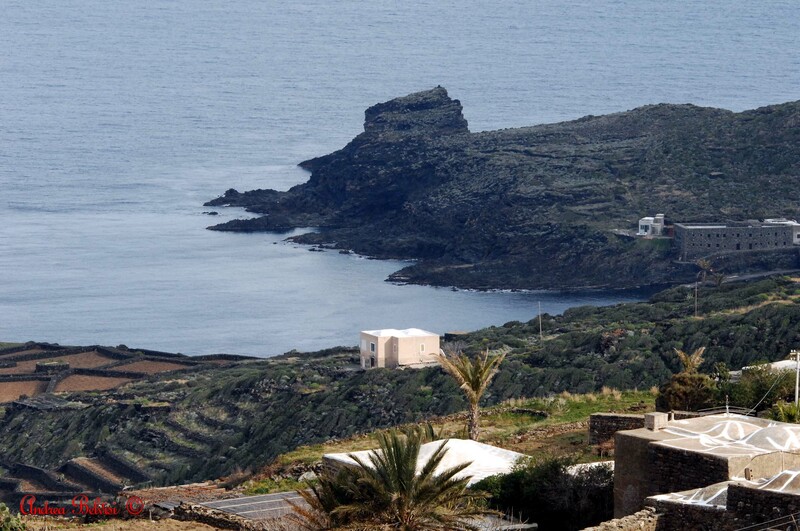 Finally, Pantelleria’s Passito, a sweet dessert wine which also compliments mature cheeses, is absolutely unmissable. 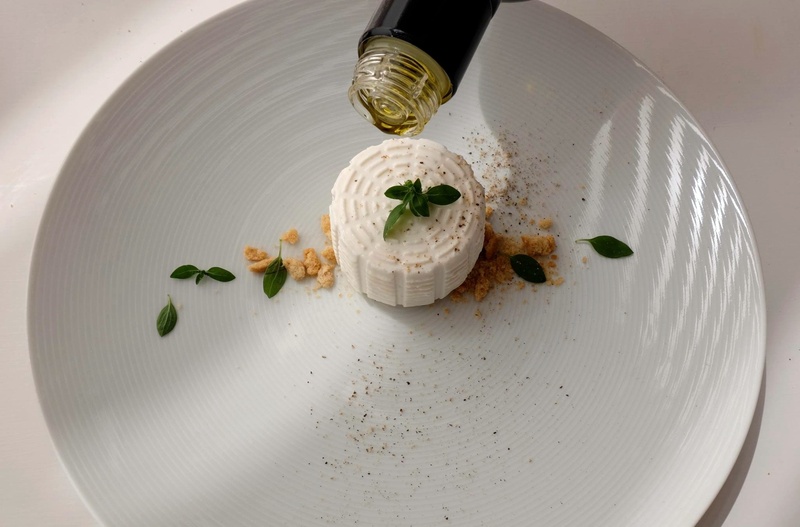 It is made exclusively with locally grown Zibibbo grapes. 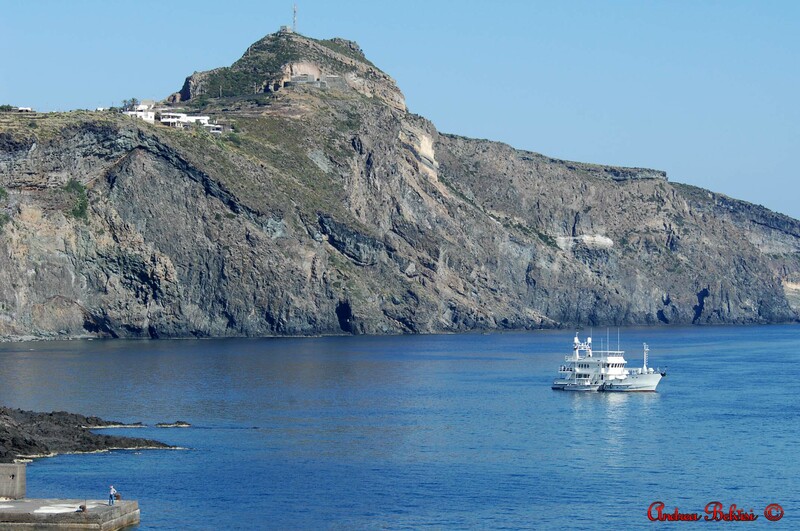 This product is promoted to the world through a yearly event solely dedicated to Passito wines, called Passitaly.